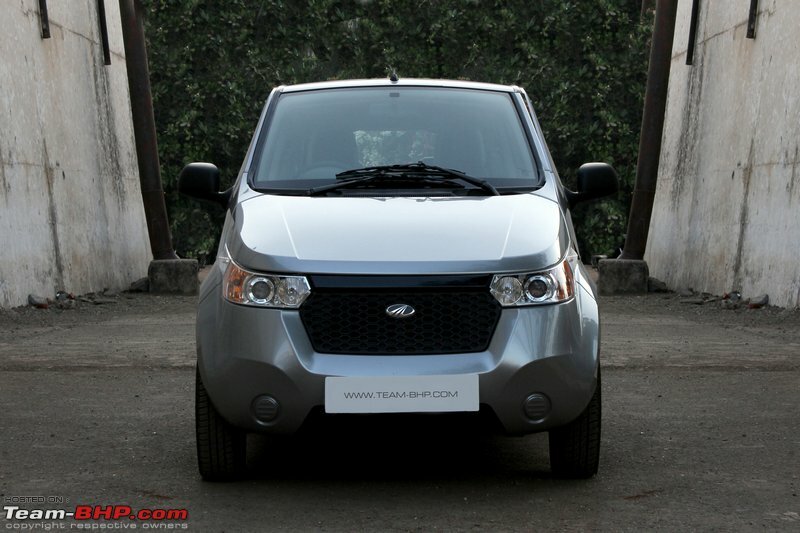 The Mahindra e2o has been launched in India at a price of between Rs. 5.95 - 6.25 Lakhs (on-road Delhi). 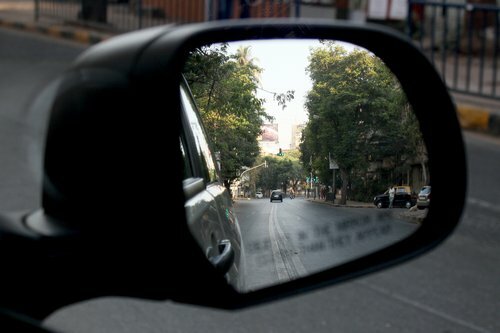 The road ahead for electric vehicles in India sure is going to be an interesting one! 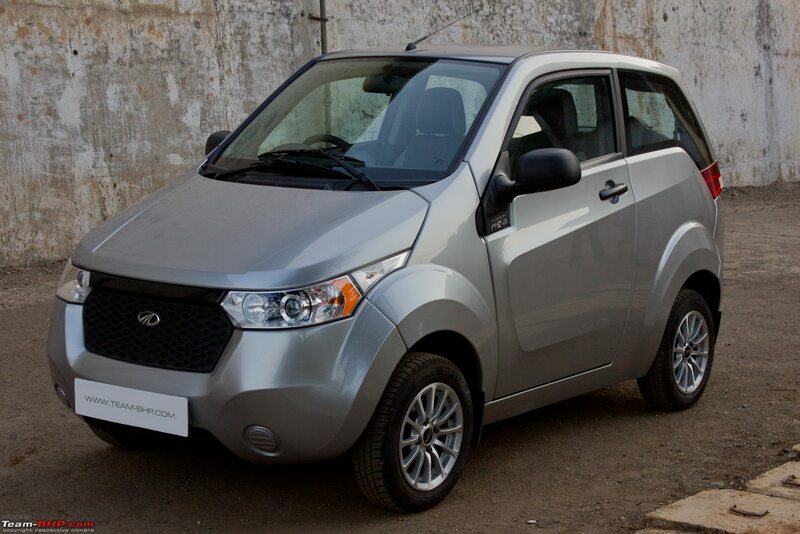 There's a debate about how 'green' fully-electric cars like the Mahindra e2o really are. Sure, they have zero tailpipe emissions, but the electricity is still being produced (creating pollution) elsewhere. This act of taking pollution away from the cities to other locations is called de-centralizing pollution. Moral implications aside, it's considered to be a good thing. We'd only be de-centralizing power (not pollution) if hydro, nuclear, solar and wind were the major sources of power, but India still gets around 60% of its electricity from coal, with the next biggest chunk coming from petroleum. Taking a deeper look, 'internal combustion engines' found in conventional cars are extremely wasteful – they run at about 25% efficiency, and less than 20% of the energy makes it to the road. All the other energy gets wasted as heat. Now, car engines have to be designed as portable and light, whereas power stations can be huge and heavy, enabling them to harness energy that otherwise gets wasted. This makes power stations 2-3 times more efficient than car engines. They also have far better means of converting the resultant bi-products into more eco-friendly elements. Keep this in mind when people say that electric vehicles are only moving the pollution problem further away from us. Are electric vehicles the correct way forward for the future? I'm not an expert on the subject, but I think they are definitely a step in the right direction. 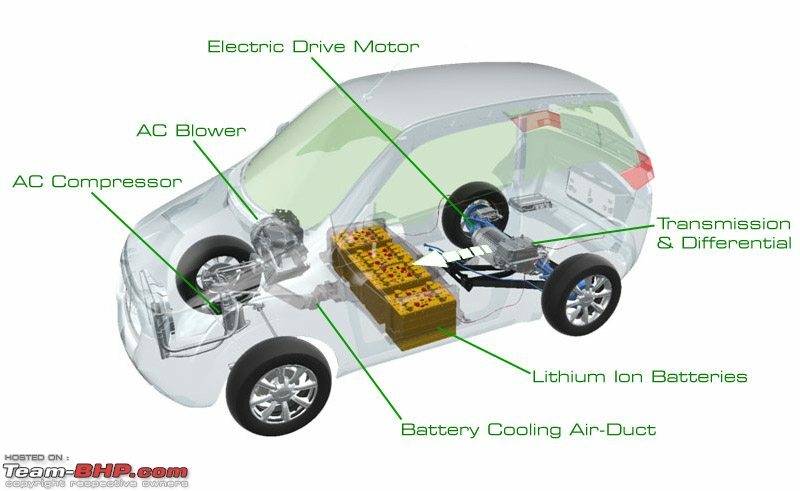 Perhaps, EVs will find their success working in tandem with other new-age fuel & power source technologies. In other markets, Governments have seen the need to reduce their oil consumption and provide several incentives to EV owners. Some of the biggest advantages of electric cars include the ability to have heavy congestion taxes waived or circumvent traffic by getting access to exclusive 'car-pool lanes'. Unfortunately this doesn’t apply to us. However, I'm sure our Government will add perks for EV buyers once they are under more pressure from the car manufacturer's lobby. Why would such a small car cost so much? Well, my best guess would be a mix of un-harnessed economies of scale, expensive imported batteries, heavy taxes and lack of subsidies...all adding up. Delhi offers a 29% subsidy on electric cars. Other states haven't followed suit yet. It's unclear if the Central Government has a subsidy planned, even though talks have been happening for years now. 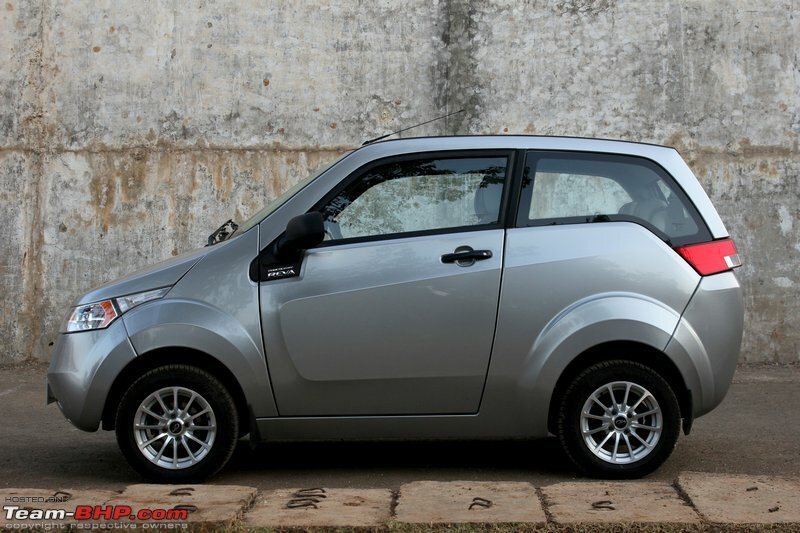 It's hard to do an apples-to-apples comparison between the e2o and any other car in the Indian market. The disparity between electric vehicles and fueled ones becomes apparent once any figures are compared on paper. If we were to compare, would we choose its competitors based on price? Running costs? Alternative fuels? Automatic transmission? Vehicle size? Features? Engine power? To be honest, EVs are still new in India and at this price-point, prospective e2o buyers are those early adopters who have an ideology in their minds that makes them want to purchase an electric-vehicle. All the specs and figures are just supplementary guidelines for comparison. We'll follow a similar approach with the comparo sheet below, choosing a mix of cars that relate to specific facets of the e2o well (but not as a whole). This will help you guys put some things into perspective. As you can see, this isn't a budget car. 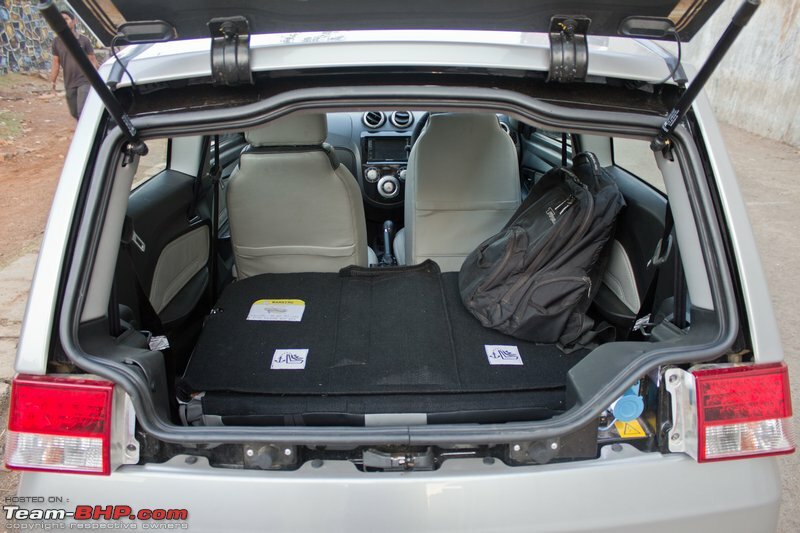 It's close to premium hatchback territory, especially in the non-subsidy cities. The higher cost is negated to some degree by the extremely low running costs (we'll calculate these later in the review), but it's still not at a point where it makes undeniable financial sense. If you're considering a company purchase, don't forget to work in the advantage of that 80% accelerated depreciation (related post)! 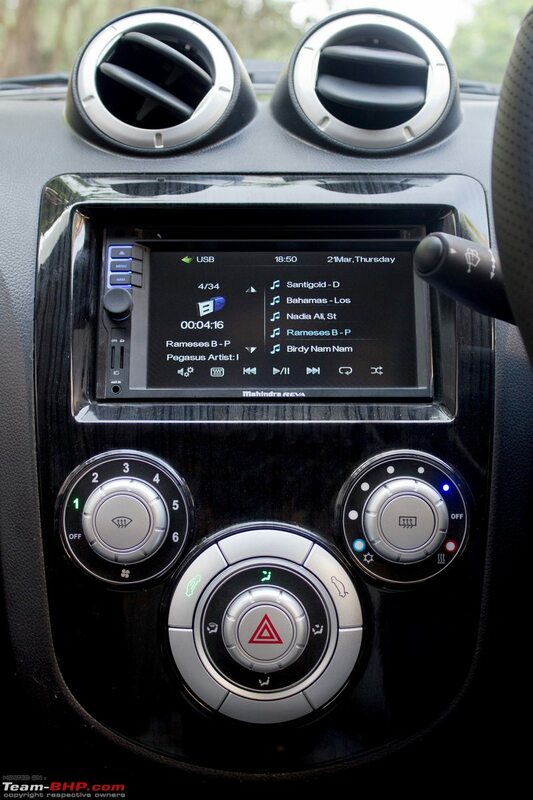 The e2o's lower "T0" variant has the same equipment and features as the top-end "T2" variant we tested, except for the touchscreen audio system and the USB, Aux-in & reverse camera that come connected to it. Also, let me set the comparison benchmark here. 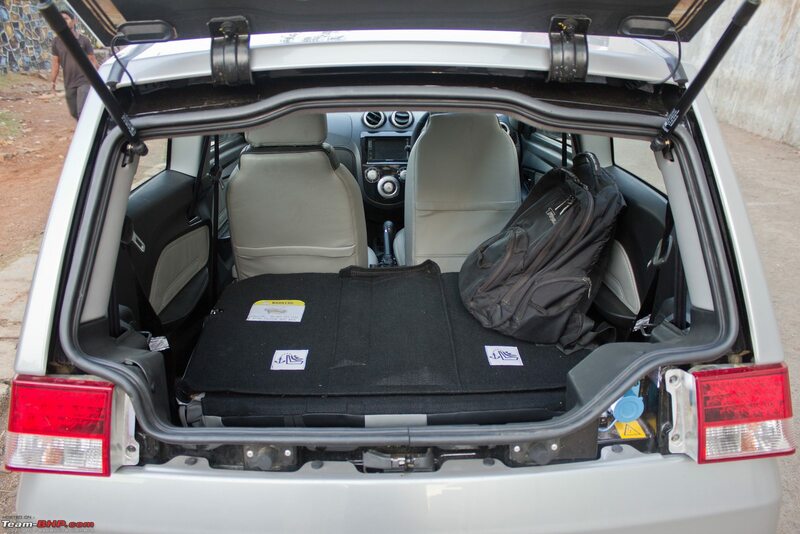 I’m treating the car like a full-featured hatchback. It's no longer a quirky little toy like the Reva-i; the e2o is here to play with the big boys. We drove the e2o on the traffic-packed potholed streets of Mumbai. We drove it like it was any other test-drive car. We didn’t baby it at all, and we didn't go easy on it for fear of running out of charge. Last edited by Rehaan : 9th April 2013 at 11:53. The e2o is a lot bigger than the Reva-i that it replaces. If you've ever seen a full-grown person driving a Reva-i, you'll know that it looks somewhat like the circus act where a bear is made to drive around in a toy car. The new e2o however, is significantly bigger. This car has grown up past toy-like dimensions into the proper hatchback realm. In fact, it's longer than (only) the Nano, wider than the WagonR and taller than an i10. The e2o has an extremely short wheelbase though; about 30-50 cm shorter than all the 4-door hatchbacks on sale today. The e2o has a lot of unique things about it. Not only is its electric powertrain something we've never experienced before in India, but there are other things done differently too. 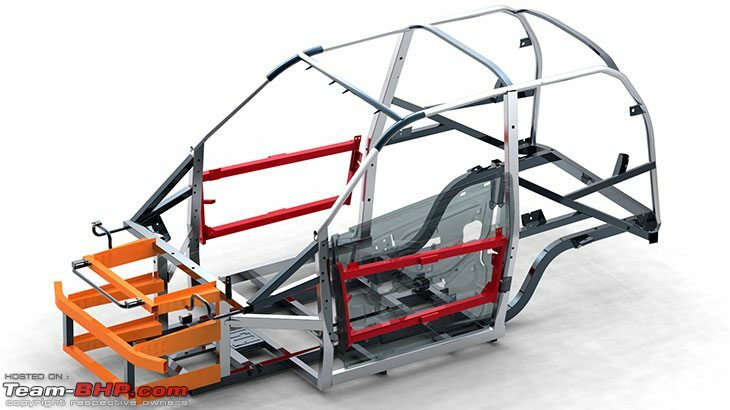 Unlike the monocoque construction of all other hatchbacks (where the body shell is the primary structural element), the e2o is built upon a steel tubular-frame instead. You'll see a diagram of the same below. This is done to save weight, since weight is something that electric cars are scared of twice as much as fueled cars. Why? 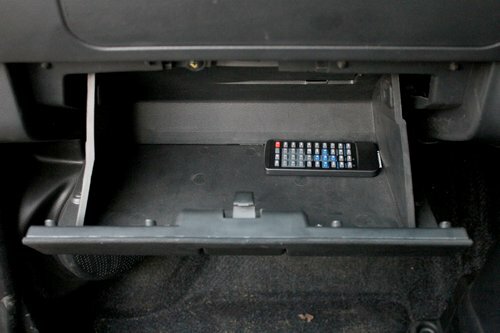 Not only does weight affect acceleration and braking, but it also reduces range per battery charge! The weight saving measures are all offset by the hefty battery pack though, and the e2o tips the scales at 830 kgs - not too far off from the i10 & WagonR. 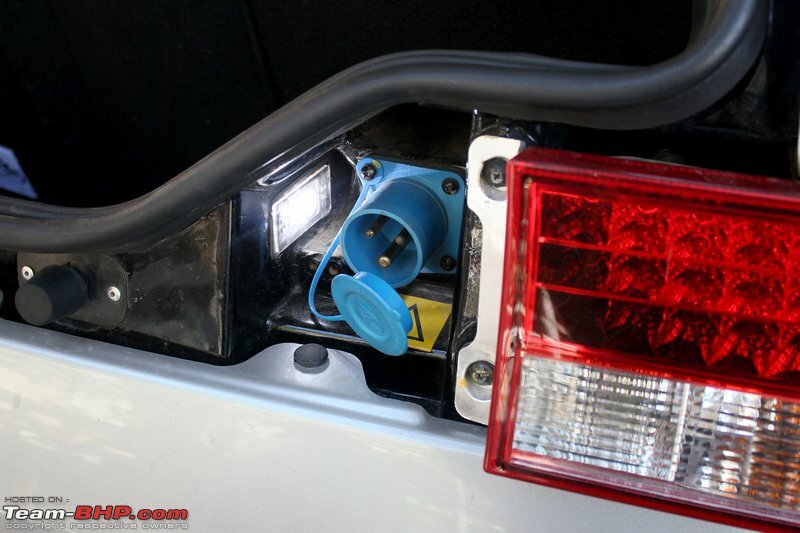 The e2o has another weight saving trick. It does not use metallic body panels. 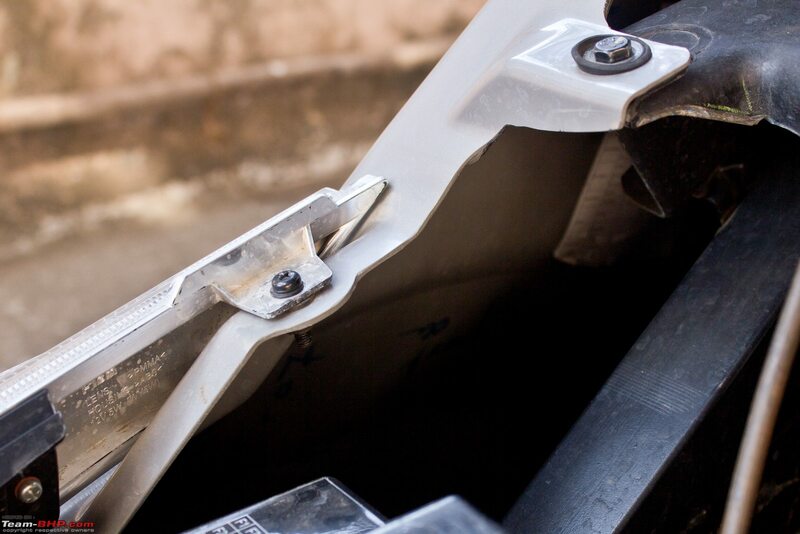 Each and every one of the car's body panels is made from ABS-plastic. It’s the same stuff that items like suitcases, construction hats and toothbrushes are made of. 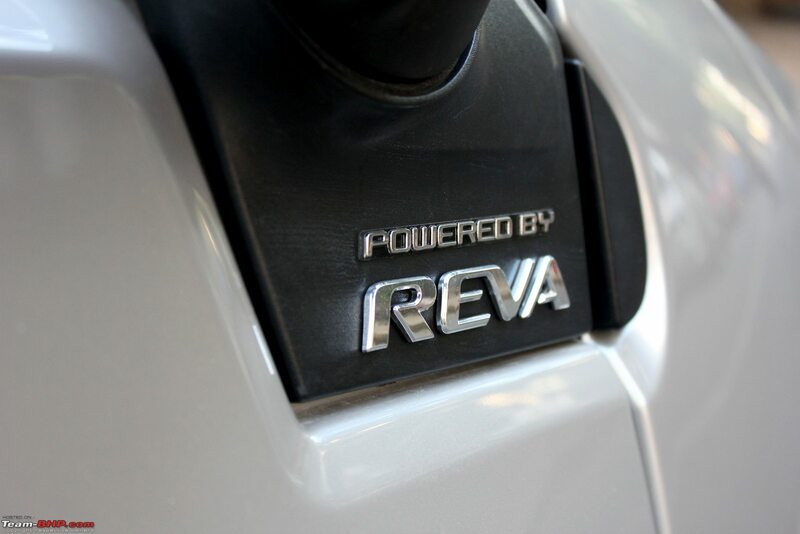 Mahindra Reva say there are a few other advantages to this, apart from the weight saving. Firstly, the panels are impact resistant. If your car gets hit by a rogue football (thanks to kids playing in the building), it won't dent. We reluctantly punched the door panel a few times as hard as we could, and it didn't dent! You'll see it in the video. Secondly, the body colour is infused into the plastic itself. 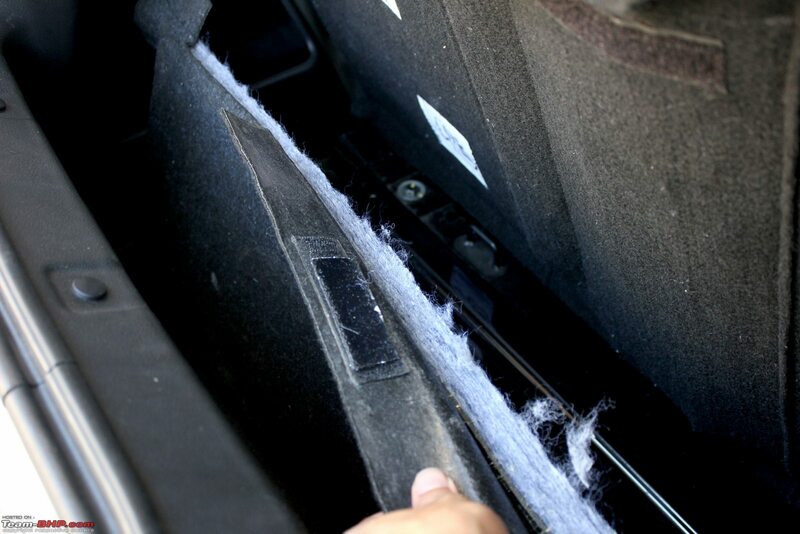 Unlike conventional cars, there's no top-layer of paint that can scrape off. Perhaps, grazes and scratches will be less obvious, and could even be buffed out more easily. The eco-advantage of this is that the cocktail of chemicals required for painting a car aren't part of the manufacturing equation at all. 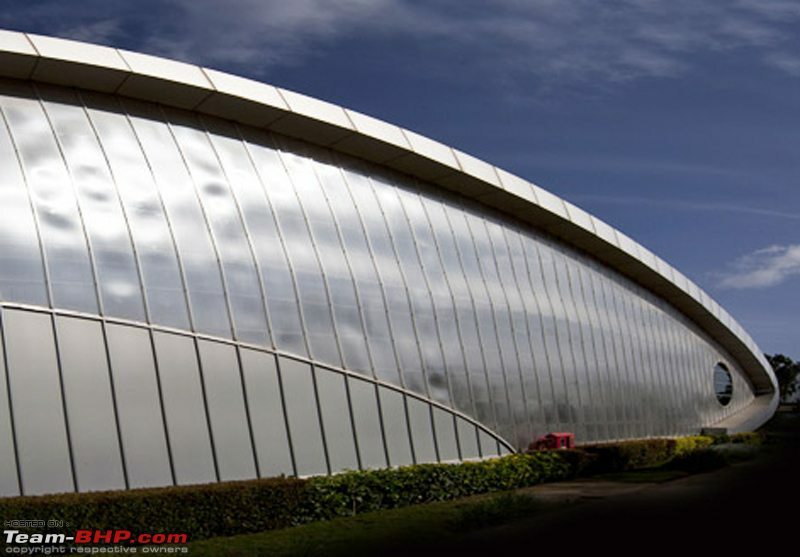 That said, I'm not sure how eco-friendly the production of ABS plastic panels is in comparison. The e2o is available in 6 colours. I'll write them in plain English: Red, Green, Blue, Yellow, White and Silver. The Silver (as seen on our test car) is more like a Grey. I think it's good that the White and Silver (Grey) colours are offered - for those prospective buyers who want to save the world quietly. 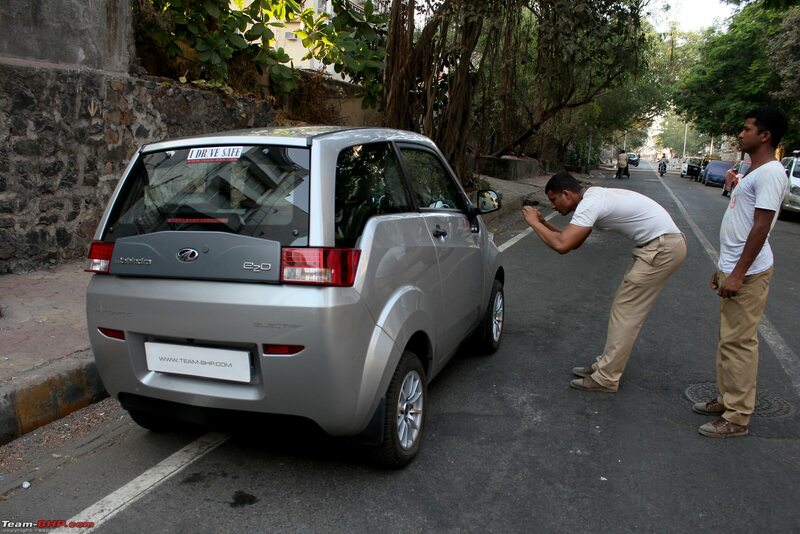 As it is, the e2o gets more than enough attention on the streets. I wish there was a Black colour on offer though, it would help mute the love-it or hate-it styling. Speaking of styling, in case you didn't already guess, Dilip Chhabria was involved here. I believe he set the Mahindra Reva team in a particular design direction at the start, and they took it from there. Personally, I'm not a big fan of the way the car looks on the outside. However, while driving around town, a majority of people said "cute" and "Nano se aur solid lagta hain" [It looks more solid than the Nano]. Interesting, isn't it? Just like Mahindra gave the XUV500 a powerful stance & tough look with the flared wheel arches, they've done the same with the e2o's excessively emphasized wheel arches too. It seems to work on the common man, many of whom stopped by just to say how 'solid' the e2o looked. 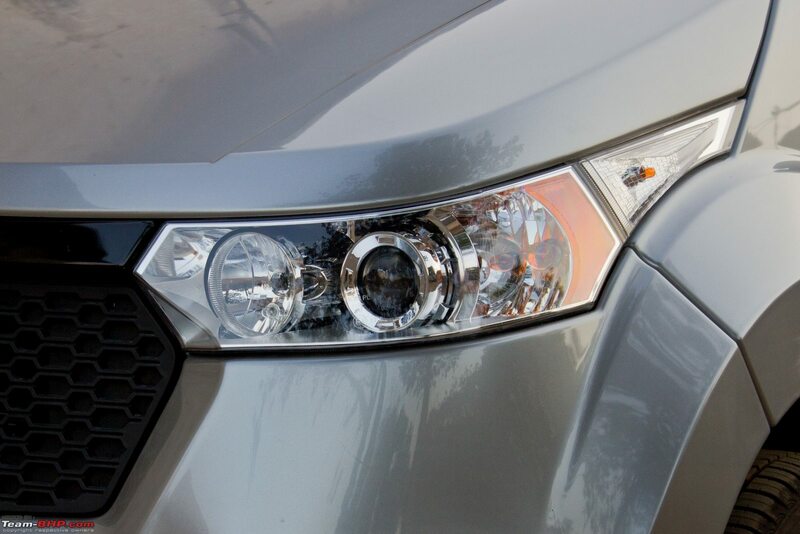 The front has halogen projector headlamps, which aren't offered on any other cars in this segment or even on cars a segment higher. 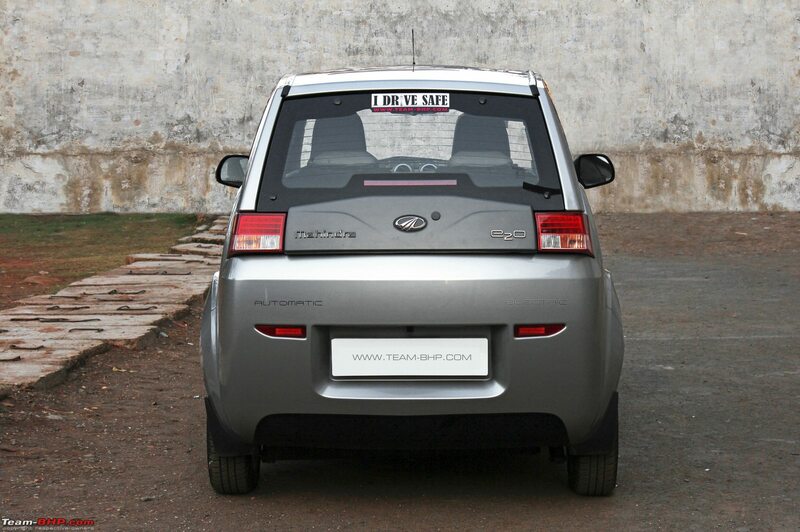 At the rear, we have LED tail-lamps, and a bunch of badges and stickers. The two important ones are "Electric" and "Automatic". A smart marketing move for visibility and awareness, as once again, these were the hot topics of discussion and questions amongst passersby. The e2o follows Mahindra's naming superstitions by ending the name with an "o" - like Scorpio, Bolero, Xylo, XUV 5-double-o, etc. Last edited by Rehaan : 8th May 2013 at 23:25. Get seated in the cabin, and you'll immediately realize that the e2o's fit and finish are good. Nothing looks cheap, flimsy or ill-fitted. The materials and colours have been tastefully chosen. Everyone who saw it was very impressed and there's no comparison with its predecessor, the Reva-i. 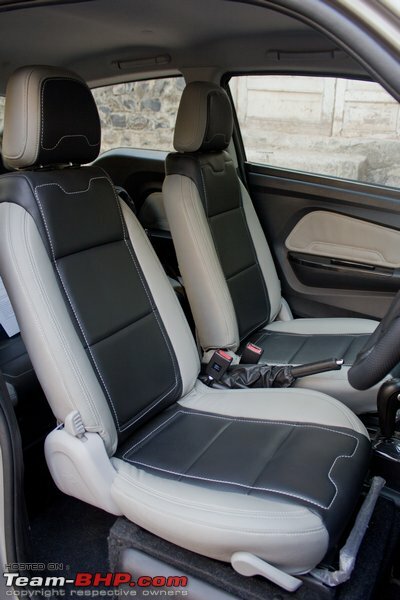 However, we have to compare it to other cars from the same price bracket and so, we'll say it's well on-par with the interior quality of its price-wise competitors. The door hinges are fairly snug, making the light ABS-plastic clad doors feel like they have some serious heft to them, when they are being opened and shut. 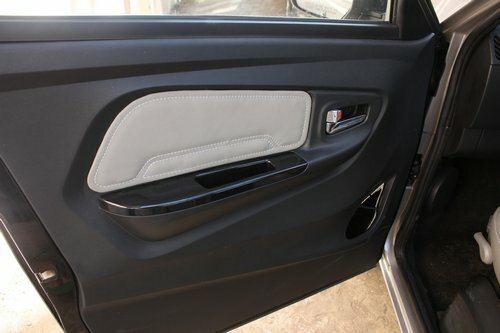 All rubber beadings (around the doors and rear hatch area) are well fitted and feel like they are of good quality too. Get inside and there's a surprising amount of space in here. The e2o's external dimensions are similar to the Nano. 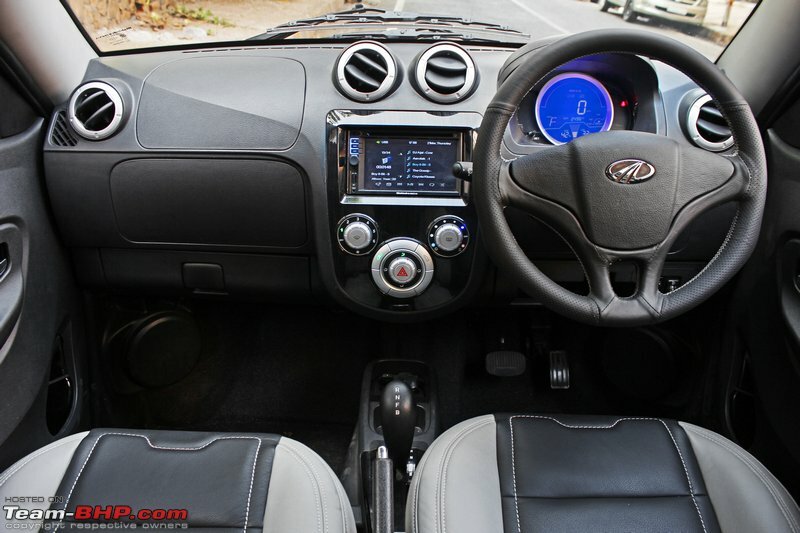 When seated at the front, it comes close to matching the excellently packaged Nano for space as well. It's fairly airy in here, and the tall-boy seating position makes intelligent use of the interiors. The front seats are high-perched (remember, the battery pack is located below them). 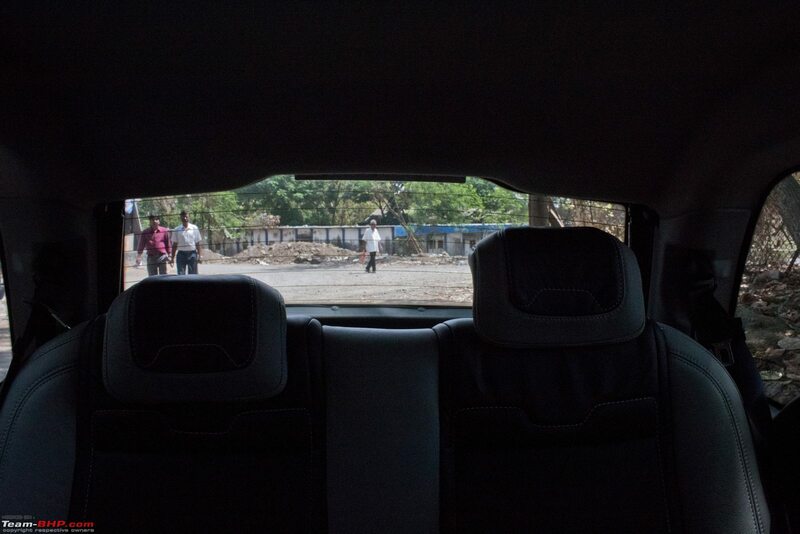 They have a 'dining chair' like seating position, very similar to the WagonR. This is not cool or sporty, yet it's very comfortable. Legroom and headroom for taller drivers aren't an issue at all. The black wood-finished trim used to highlight parts of the interior is very subtle and tastefully done. The shiny trim looks just like a piano-black finish, unless you look at it more closely. The steering feels chunky and has some contours molded into it. The material textures and cross-stitching are nice too. On the other hand, the stitching at the cutout for the thumb-rests is fairly sharp and pokey. On longer drives, this started to hurt my thumbs. There's no rake or reach adjustment either, so depending on your seating position, the view of the top of the instrument cluster can get blocked out by the top of the steering wheel (as was the case for me). The IRVM too has a similar issue. You can only see about 100 meters back, since it's mounted higher than the top of the rear windshield. The roof cuts off any view beyond that. 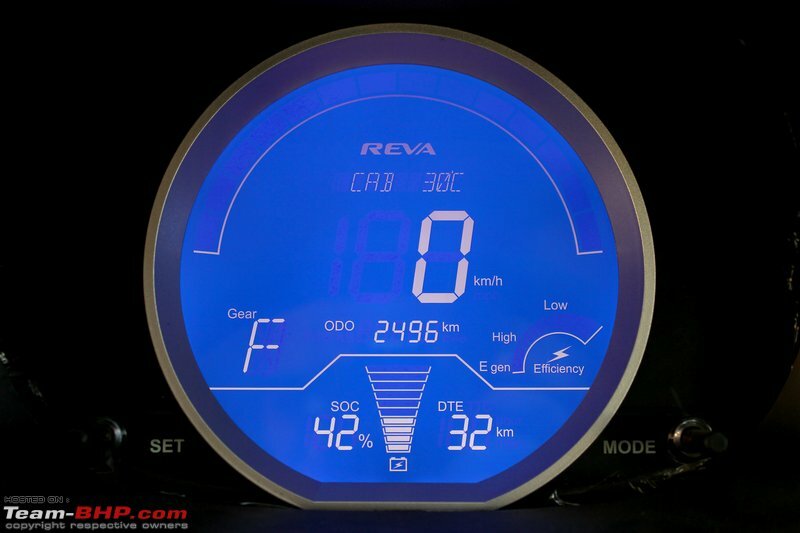 The blue backlit instrument cluster with white text looks crisp and modern. It's very clearly visible in the day as well. 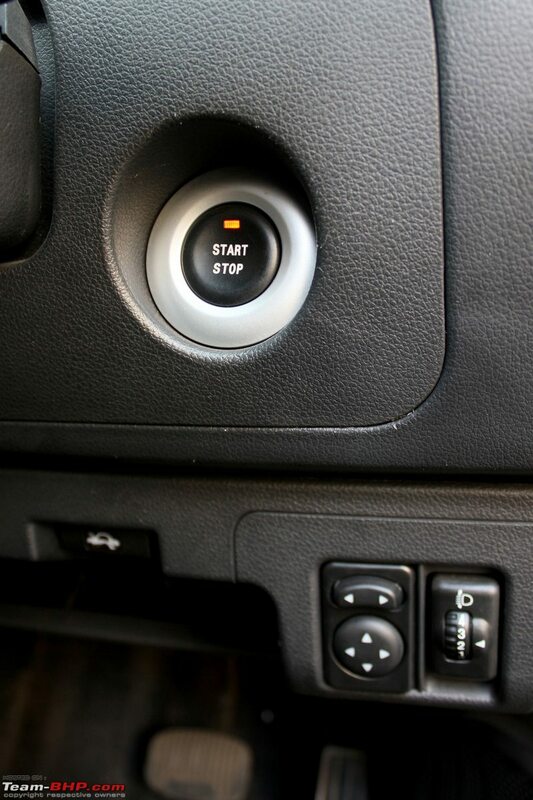 When you press the start/stop button, it requests you to authenticate the key by holding it near the button. This didn't work too well though, with the key only registering about 1 in 3 times for us. It was frustrating! 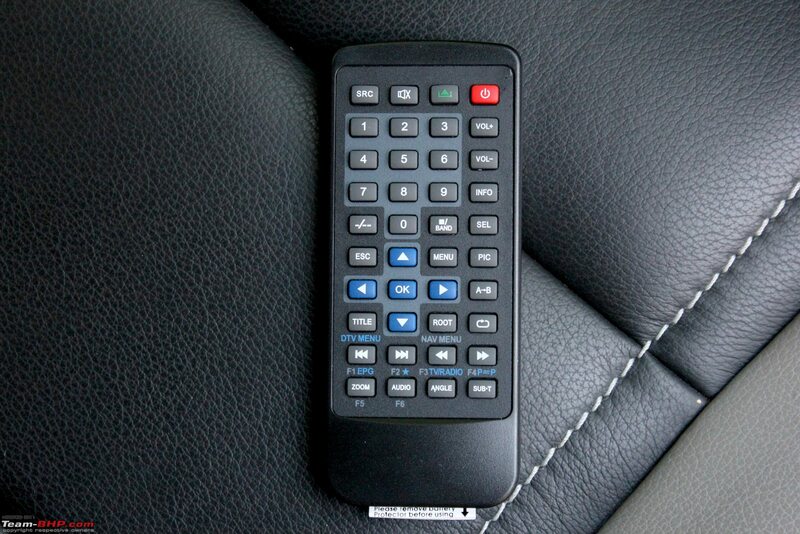 You don't need to authenticate the key to turn on the A/C or other accessories. It's only required to drive the car. 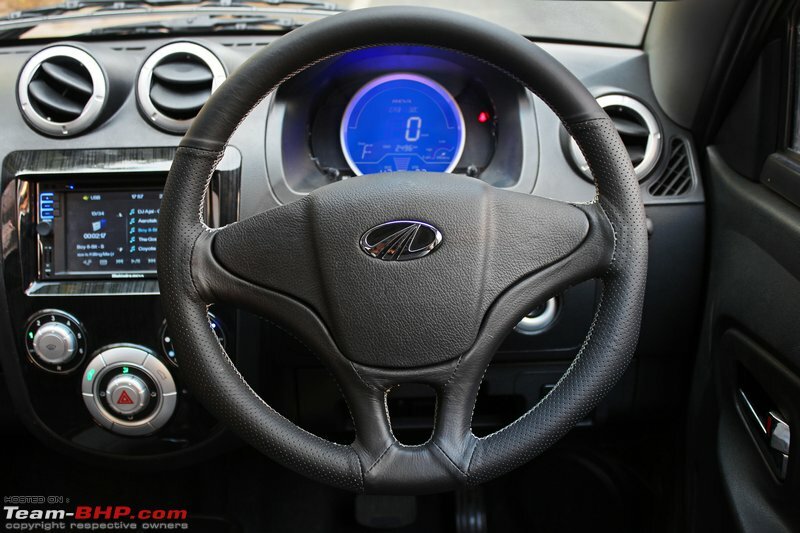 Interestingly, Mahindra has gone with a conventional looking "Automatic" gearshift. The earlier prototypes had a forward/reverse rotary knob on the dashboard (since in reality, it's just an electrical switch). They have probably done this to keep things familiar, making the e2o look more like a "normal car". Indians are skeptical enough of electric cars as it is, so the closer this looks to what they are comfortable with, the better. 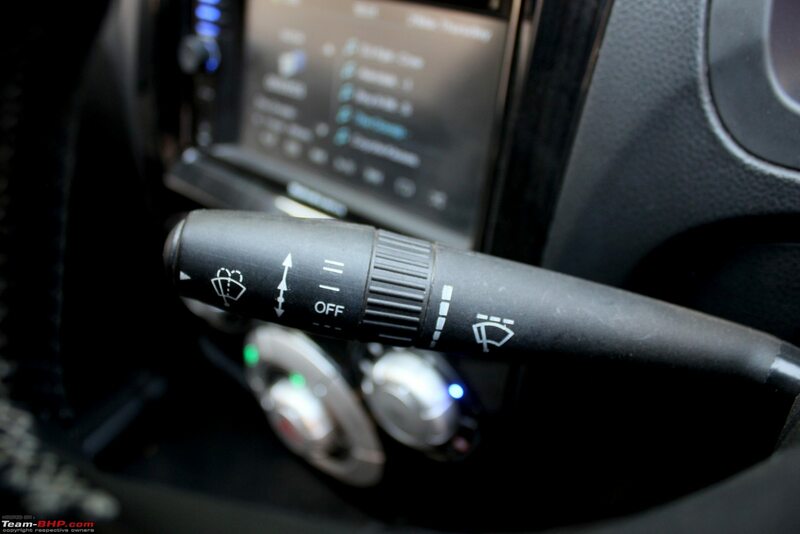 On the front of the gearshift is a soft-touch button that needs to be pressed in order to shift the lever. Only the shift between "Forward" and "Boost" doesn't require a press of this button. Another interesting marketing move is the fact that they've badged the e2o as an "automatic", when in reality, it's a single-speed transmission. 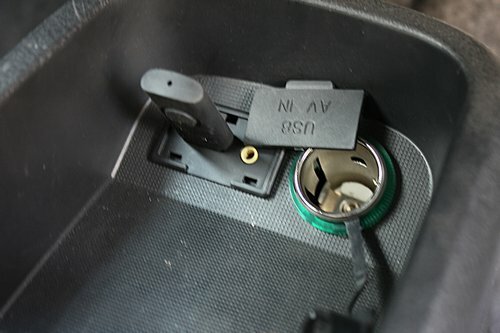 Window switches are located behind the gearshift. There is no one touch up / down functionality. All the switchgear in the cabin has a solid feel. The indicator stalk has the lane-change functionality where it blinks 3-times on a soft press. The air-conditioner is impressive, even on hot Bombay afternoons with no sunfilm on the windows. The blower has 6 selectable speeds, each one being marginally more powerful than the next. I used speeds 1 & 2 which did a satisfactory job, even with the onset of summer. 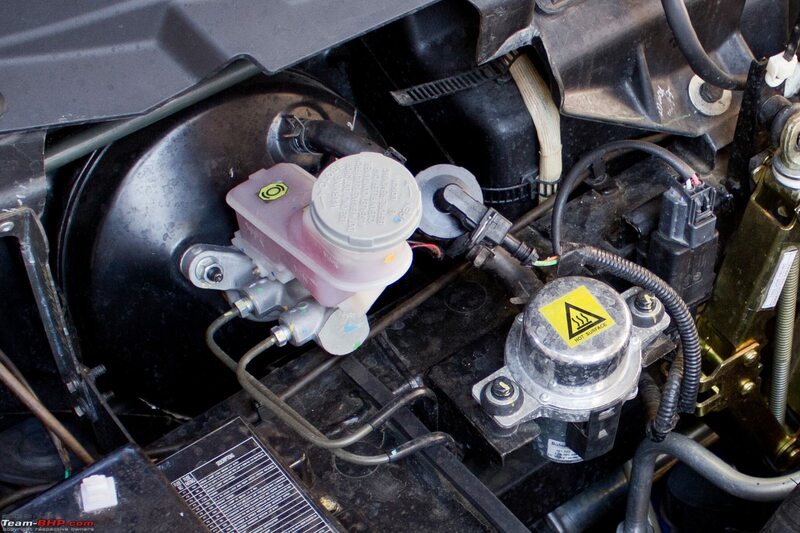 The compressor is an electric unit, and the e2o even has a heater mode for the colder days. The cabin & ambient temperature are shown alternatingly on the instrument display. If you're stuck in awful traffic, running only the A/C for a full hour uses roughly 10% of the e2o's battery charge. Irritatingly, the A/C always starts off as a blower only. You have to turn the temperature knob (manually) each time you want to activate the A/C. Not only does this happen when you first turn on the car, but also if you turn the blower off for just a minute and then restart it. 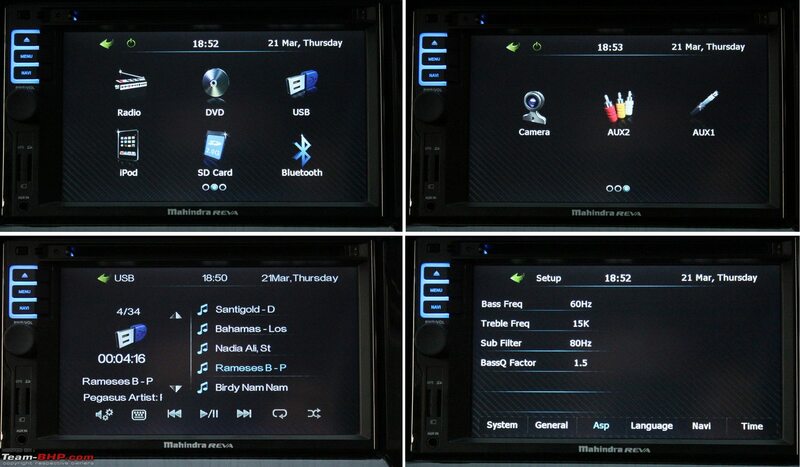 The e2o has a 6.2" touchscreen audio and entertainment unit. It is a fairly high-resolution resistive screen, quite responsive and loaded with a host of features, and a "carbon fiber" wallpaper too. 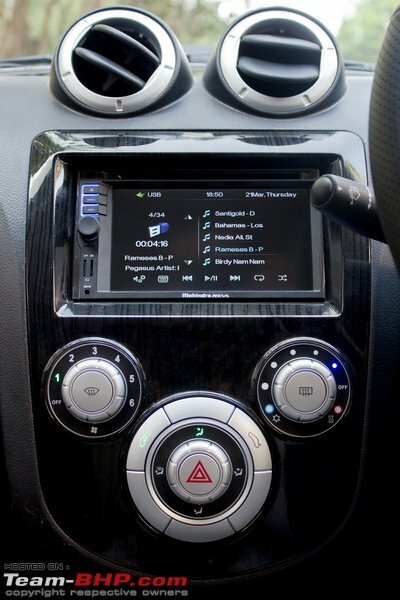 Inputs include DVD playback, USB (with iPod integration), Bluetooth (phone & audio streaming), 2x Micro-SD slots (Media & GPS data), a 3.5" AUX-in and apparently a composite AUX-in as well. GPS navigation is provided, and the fact that it is integrated with the distance to empty (DTE) count of the e2o is awesome. 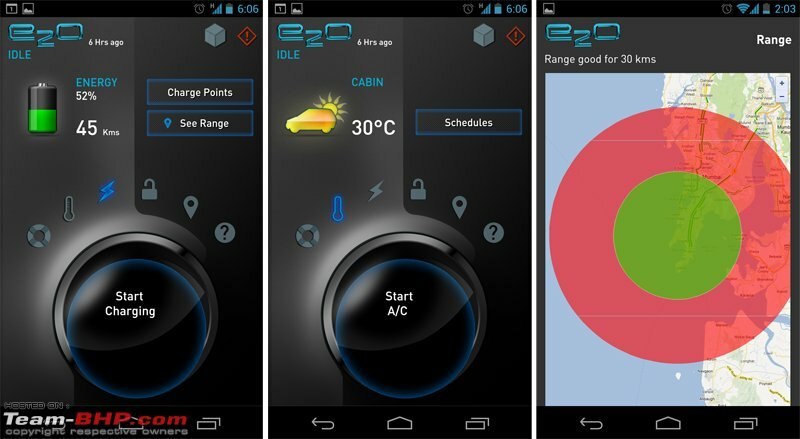 It can show you charging stations & service centers within your battery range. The reverse camera too shows up on this screen, and the music automatically mutes once you engage reverse gear. I don't think I've seen such a host of features on a head unit in this segment, or even in cars at twice the price! It's worth noting that the lower 'T0' variant doesn't get this head unit and all its ancillaries. The system is advertised as having 4 JBL speakers. The settings menu indicates support for a sub-woofer pre-out too. However, the sound was tinny, and there was absolutely no bass. The mids too were weak. In this condition, I would have given the sound quality a 6/10. D-BHPian SS-Traveller did get a chance to try the audio system in another e2o, and he said the sound was surprisingly good, which confirmed my suspicion that there was some sort of speaker connection problem in our test car (the equalizer settings were fine). 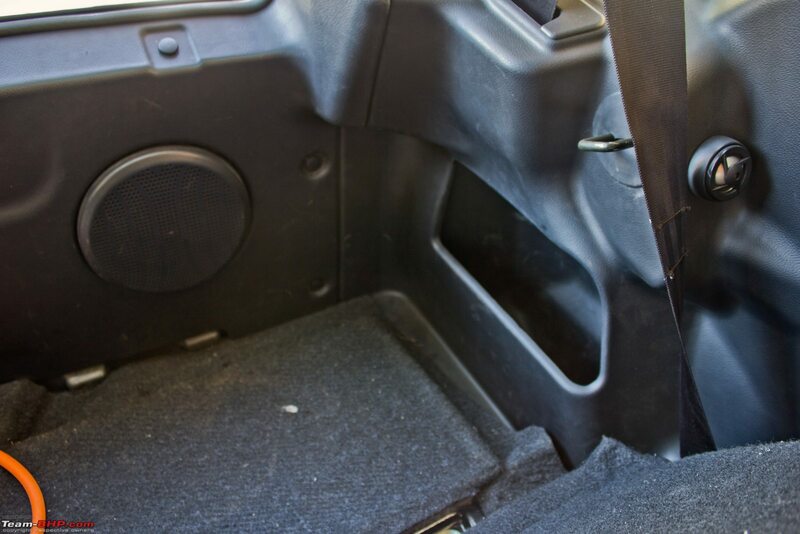 Being a 2-door, you have to flip the front seats forward to access the rear. Pull one of the two available levers, and the whole seat slides ahead in a very smooth manner, almost like its motorized. Squeezing through the gap requires you to hunch over a bit, but once you're seated, it's comfortable and there is sufficient legroom. Thanks to the tall-boy design, leg space is comparable to the smaller hatchbacks. Head room isn't a problem either, even for taller occupants. Each rear passenger gets a small molded armrest on the side panels, which wears a padded and stitched fabric inset like the front doors. 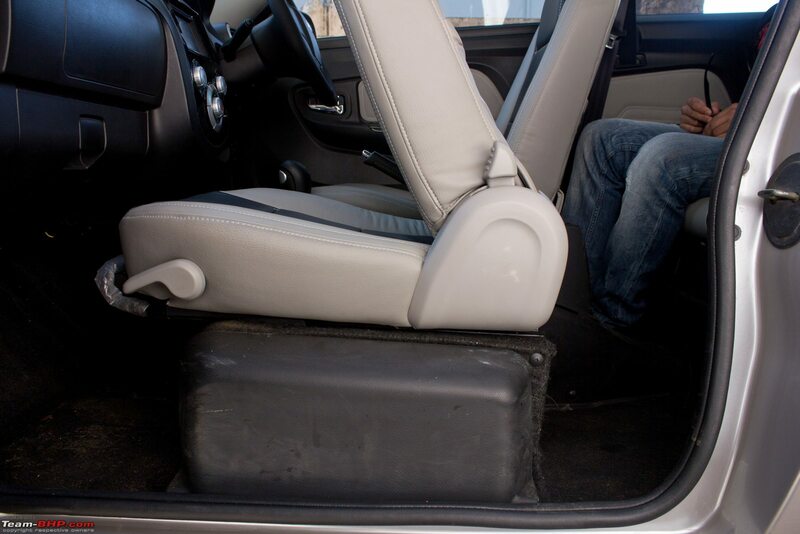 Adjustable head-rests and 3-point seat belts are part of the package. 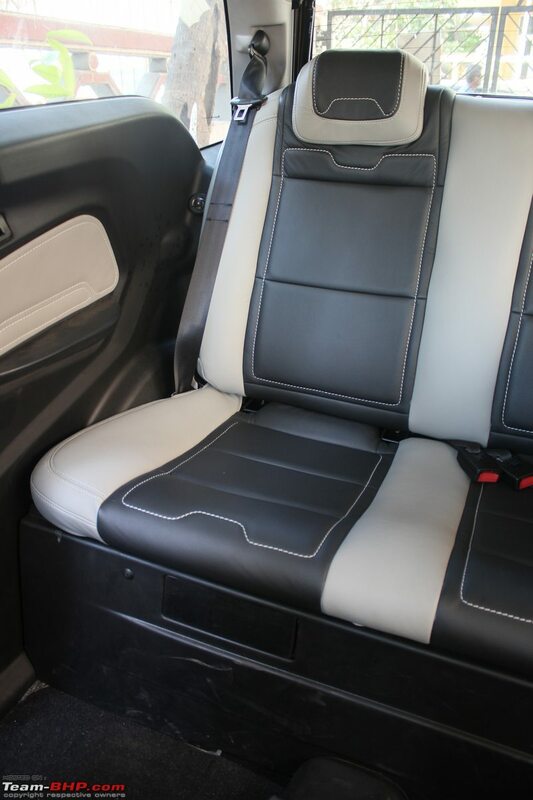 Two adults can sit back here quite comfortably, but the option for squeezing in a 5th passenger doesn't exist. On the safety front, the e2o does not offer airbags or ABS. 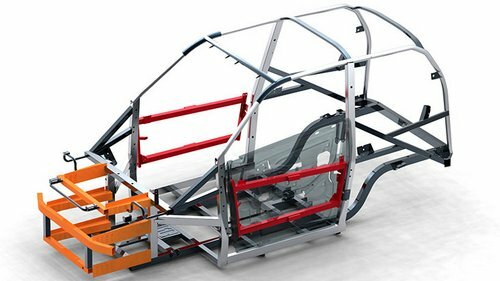 It does have 3-crumple zones, and given that it is soon to be sold in Europe, it has been designed with the NCAP crash tests in mind (though the results aren't out yet). Front seatbelts have a pre-tensioner function, and rear passengers get 3-point ALR seatbelts which enable the use of a child seat. It gets central locking, an immobilizer, adjustable head restraints for all 4 passengers and follow-me-home headlamps. Last edited by Rehaan : 9th April 2013 at 10:45. Let's get this out of the way first. After seeing how the e2o is a full-featured hatchback alternative when it comes to the interiors, the next logical question is : Can the e2o keep up with traffic on the average intra-city commute? I think the answer is YES. The e2o is powered by a 19 kW (kilo-watt) electric motor. That translates to about 25.5 BHP @ 3,750 rpm. It might sound measly (even the 2-cylinder Nano has 37 BHP), but the numbers don't really tell the true story in terms of driveability, as we're only looking at the peak output. Also, keep in mind that unlike internal combustion engines which start off weak at low rpms and then build up their power/torque output as the revs climb, electric motors have a perfectly flat torque curve all through their range. Translated, 100% of the e2o's 53 Nm of torque is available right at 0 rpm, all the way up till 3,400 rpm. 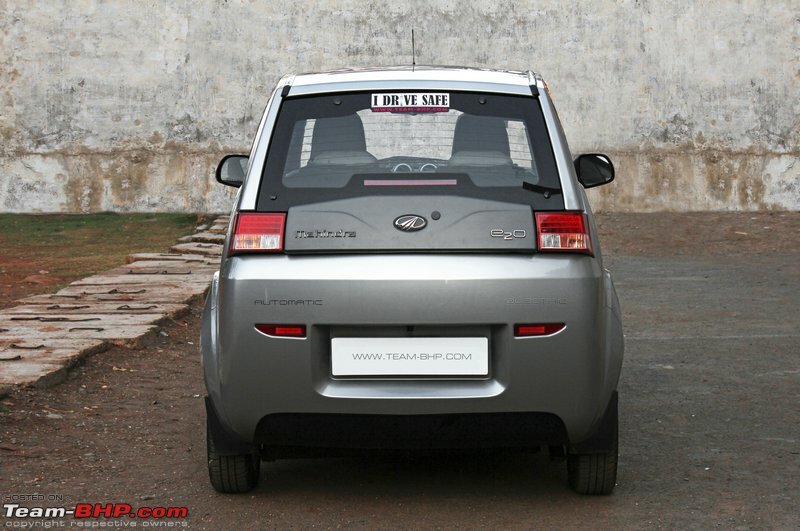 The Nano in comparison would only attain its peak torque of 51 Nm @ 4,000 rpm. Most Nano drivers have probably never revved till 4,000 rpm! Naturally this flat torque curve of electric motors is great for starting off, as well as slow-speed driveability. The instant response you get from a standstill lets the little e2o shoot ahead of all other casually driven cars in the traffic-ridden stop light Olympics. No need to engage any gears, no need to slip the clutch and no need to wait till your motor or turbo revs up enough. There's no lag, and the acceleration is smooth and jerk-free. It's lovely to dart through gaps in slow moving traffic. The car's size helps too. 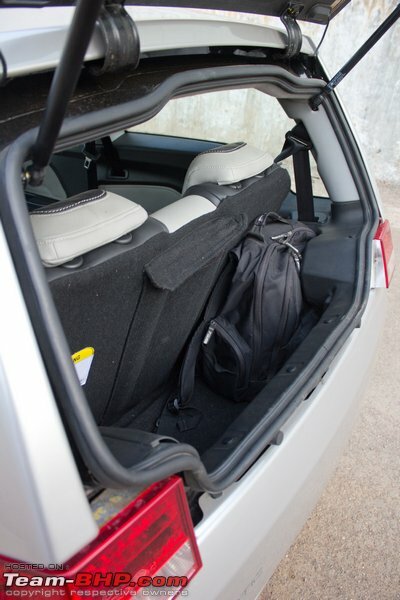 A simple dab of the accelerator and the e2o effortlessly zips off without making a big hue and cry about it. The e2o really shines in these typical stop-and-go traffic conditions (especially since there's no clutch), making it an absolute pleasure to drive in the city. However, if you're besides an aggressive driver, or the road ahead opens up and the speeds continue to increase, that’s when the internal combustion cars will shoot past the e2o quite easily. 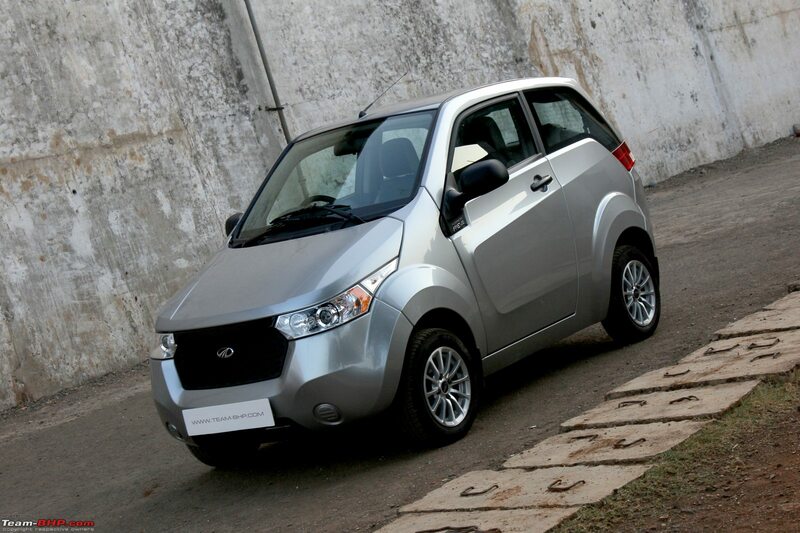 If the highway is part of your daily commute, the e2o will leave you underwhelmed. You'll need to be a fairly patient person. Once you cross 60 km/h, progress gets slower and throttle response is fairly dead. I managed to get the car up to 83 km/h on its own steam, and 90 km/h on a downhill stretch. It touched top speed without a big hue and cry. Unlike internal combustion engine'd cars, the e2o doesn't scream and strain as it reaches the end of its capabilities. It's much less obvious that it's being pushed to the limit. The rate of acceleration just slows down, until you're zipping along at a constant speed, even if you keep your foot down. A soft electric whine will give you company. Despite the slower progress as speeds increase, it's not at all uncommon to find yourself in the 70s at most open stretches during your daily commute. Click the gear lever back one position, and you're in "B"oost mode. This driving mode lets the motor have more juice, and the e2o gets noticeably peppier. I'd say it feels like a 15% increase in power. 0-60 km/h takes 11.5 seconds in boost mode. Boost was probably not worked into the standard mode since it uses up more of the battery, and generates more heat & strain for the motor and battery pack. Quite frankly, the car does pretty well in most situations without it. In boost mode, you'll be at 80 km/h in the same time it would normally take you to get to 60 km/h. There is no limit to how much you can use the boost mode, though once the battery level drops below 20%, it gets deactivated to save charge. Aside from tickling the fancy of zippy drivers, the boost function is extremely useful when you want a little extra push going uphill. Remember the flat torque curve of the electric motor? That makes hill climbing a steady affair. The car will chug uphill at a constant (and respectable) speed. Switch to boost mode, and it will begin to accelerate. I attacked some steep hills in South Mumbai (Manav Mandir & other Malabar Hill ascents) and the e2o climbed `em without a fuss in regular drive mode. Not a honk was heard behind me. It feels good to be stuck in traffic with the A/C on. The guilt of running just the AC on fossil fuels isn't present with the e2o. There's no heat emanating from the car, and no fumes either. I dream of being stuck in an all-electric traffic jam. It would be the peaceful future. It's worth mentioning that the car does not start moving when you lift your foot off the brake (like a conventional AT). It requires accelerator input. Another point is that, regardless of which gear you're in, the car will roll just like it's in neutral, unless you are pressing the accelerator or have the brakes engaged. 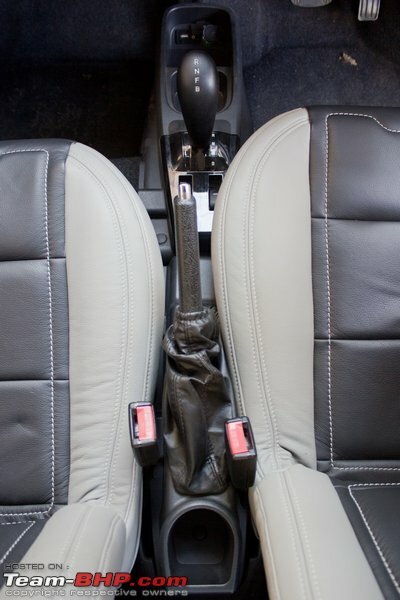 Nervous drivers, don't fret - it does have a hill-hold function that keeps the e2o in place for 1 second after you release the brake pedal, and then lets it roll backwards very slowly after that. There is a mild electric whine when you're accelerating. It gets softer when you take your foot off the accelerator. I got used to it pretty quickly, and started to enjoy it a bit too. 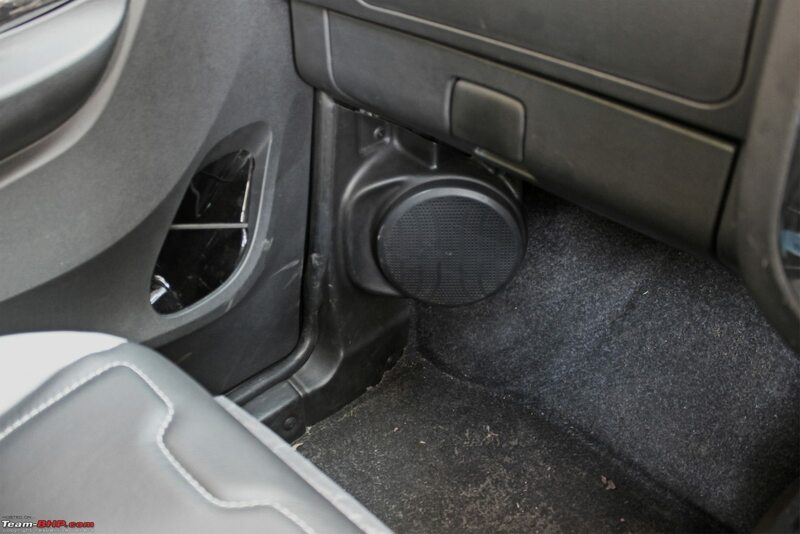 At a standstill, there is an electric-fan like whine that seems to be coming from the dashboard or foot-well area. 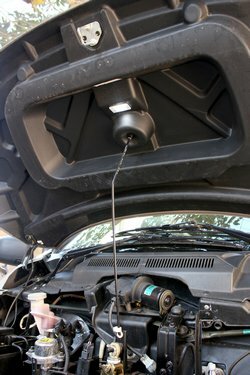 It's usually the cooling fans for the battery pack and motor below the car. There's another electric whirring sound when you press the brakes. You might notice these sounds and find them louder than expected, but the reality is that you're only noticing them more because the noise of an internal combustion engine idling away is not muffling them out. The e2o does not have a power assisted steering. Chances are it's more about cost saving than it is about the extra drain that an Electric Power Steering (EPS) would put on the battery. 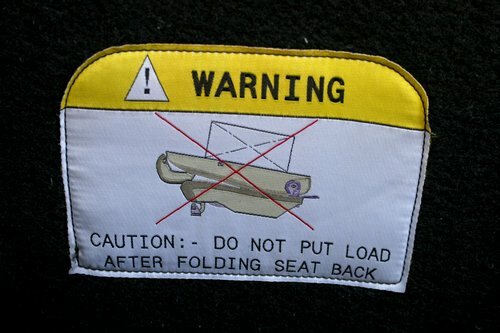 Because of this, when the car is not in motion, the steering is extremely heavy. You'll need to use two hands at 0 km/h. Get the car moving slightly and it gets better, but even when the car is in motion, it's still on the heavier side of things. It's nowhere near the light EPS units of other hatchbacks. 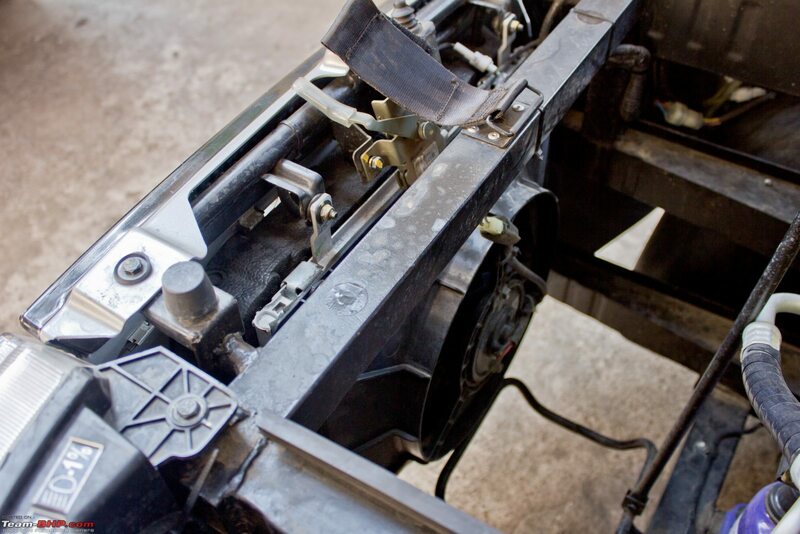 Due to the suspension geometry, the steering is also not very keen to return to center after you complete a turn. The turning radius at just 3.9 meters is ridiculously small on paper. However, in reality it's not as impressive as you'd expect. Due to the lack of power steering, it takes you a while to turn the wheel all the way. If you do wind up the steering completely in preparation, making a U-turn on a single-lane road is well within the capabilities of the e2o. The e2o is a rather neutral handler. 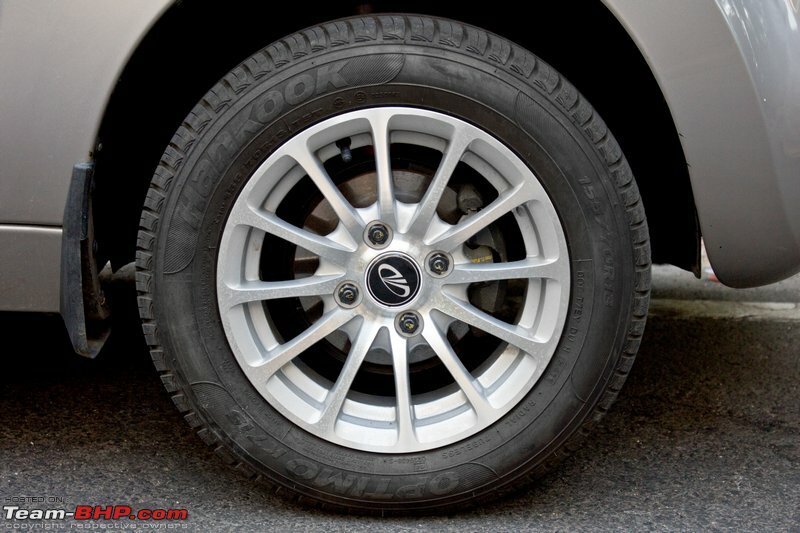 The 155 width tyres are okay for a car of this size and weight. There's no understeer, but there is a fair amount of body roll. If you take corners quickly, or change lanes suddenly, it's apparent. Naturally so, because this is a fairly tall car with an extremely narrow stance. At high speeds (70+ in this case), it can take corners quite confidently (eg. the serpentine Muhammad Ali bridge in Mumbai). However, the e20 requires a good road to do this. If the surface has bumps and ruts, the e2o will dance around on turns and it's not very confidence inspiring. 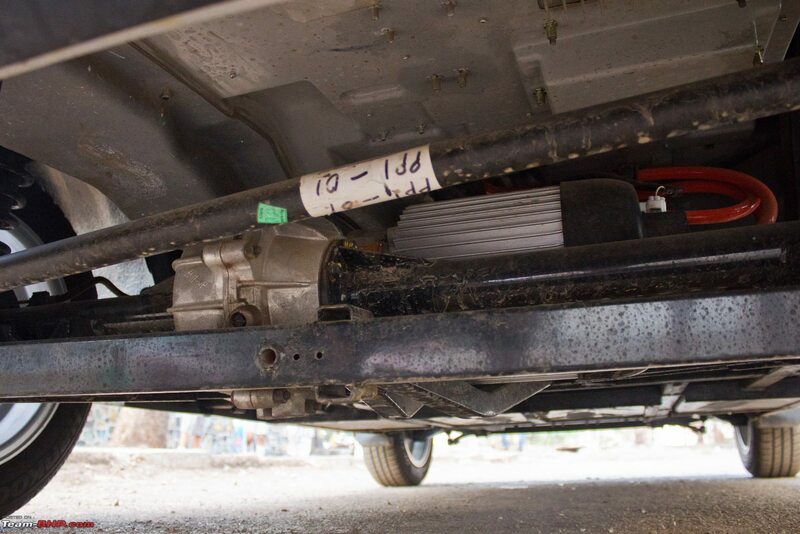 The suspension was a mixed bag on our test car. It sounded like parts were loose on multiple occasions and felt rather toy-like at times. There was some plasticy squeaking emanating from the left of the dashboard too. The ride is acceptable at the front and thanks to the tall-boy seating position, the overall level of comfort is good. You do tend to feel smaller discrepancies on the road surface though. When I was alone in the car, the rear wheels would jump off speed breakers with a loud thud, like they were attempting suicide - even at slow speeds. It's like the rear suspension didn't have the ability to soak up bumps when the rear seats are vacant. I was really not looking forward to my turn as a rear passenger - for fear of another herniated disc. However, once I was back there, I didn't have any complaints. We did the same route I had done alone, and things were well within acceptable limits. It turns out that putting a little weight on the rear axle takes care of the jumpy rear end. Other than the consistent electric hum, there's no audible tyre noise inside the cabin. Perhaps the low rolling resistance tyre tread design and the narrow 155 mm contact patch are to thank for this. There's no wind noise heard inside the cabin either, probably due to the not-very-high top speed of 83 km/h. Ground clearance at a high 180 mm was never an issue during our 200+ kms of driving the e2o. 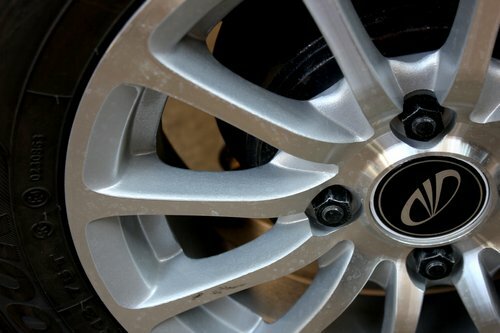 In one sentence, the braking capability is good, but the brakes have an unpredictable and sudden bite to them. Let me explain that further. When gradually depressing the brake pedal, the e2o begins to slow down. 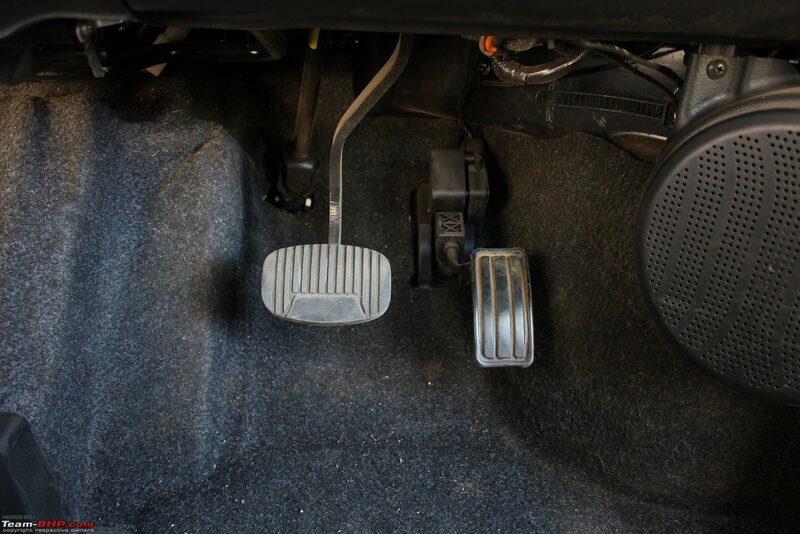 However, at some unpredictable point in this deceleration, the brake force suddenly quadruples. 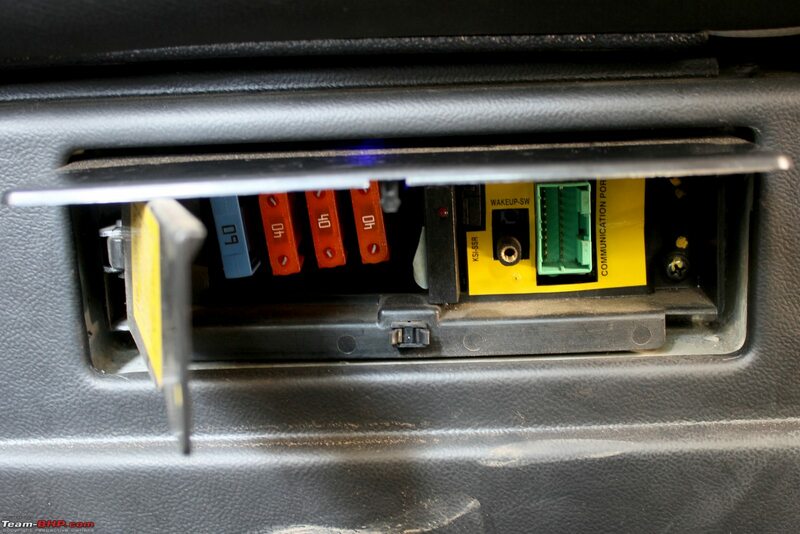 This forces the driver to release the pedal a bit to accommodate. It brings up the constant fear of being rear-ended, and there's really no getting used to the erratic braking behaviour. Mahindra needs to fix this problem. Why is this happening? Was it something to do with the regenerative braking? Doesn't make sense as the regenerative braking kicks in very seamlessly as soon as you take your foot off the accelerator (you don't even need to press the brake pedal). At least that’s what the "E gen" indicator on the dash seems to indicate. It feels just like coasting in 3rd gear in any other car. Could it be activating more aggressively when the brake pedal is pressed? Nah. The e2o has disc brakes at the front, and there is a vacuum-assisted brake booster present. These are "Power Brakes" - just like every other car on the market. But wait, those systems use the vacuum generated by the internal combustion engine to operate the booster. 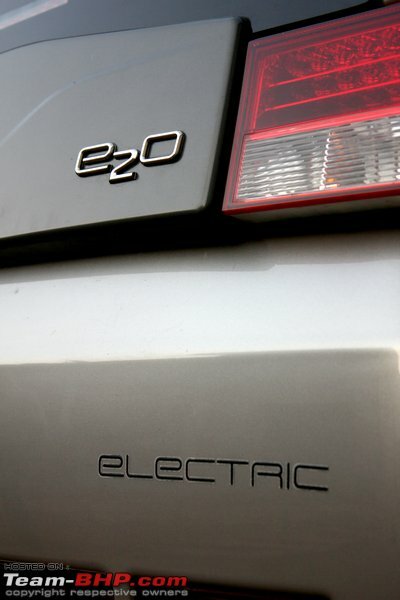 How does the electric e2o do it? Turns out, this was the problem. There was a small motorized vacuum generator that would spin up every time it felt there wasn't enough vacuum available. This resulted in a huge and sudden power-assist to the booster, which caused the unpredictable braking behavior. How can we be sure? Well, I unplugged the electric vacuum generator and it fixed the problem (Obviously not a solution, since the brake pedal becomes extremely hard to press without the vacuum assist). Adding to the regenerative braking point, it appears that the 'E gen' disengages at 1-2 km/h, just before the car is about to come to a stop. This means you have to press the brake pedal just a wee bit more to compensate and bring the e2o to a dead stop where you expected it to. This is noticeable in traffic as you slow down and plan to stop close behind another car. Due to the short wheelbase and track, braking hard while taking extremely sharp corners can cause one of the rear tyres to lock up and skid a little. I was enthusiastically pushing along my twisty home-stretch when I experienced this a few times, though I really doubt that the average e2o owner would face a similar situation more than once or twice in their entire ownership. Last edited by Rehaan : 9th April 2013 at 11:24. 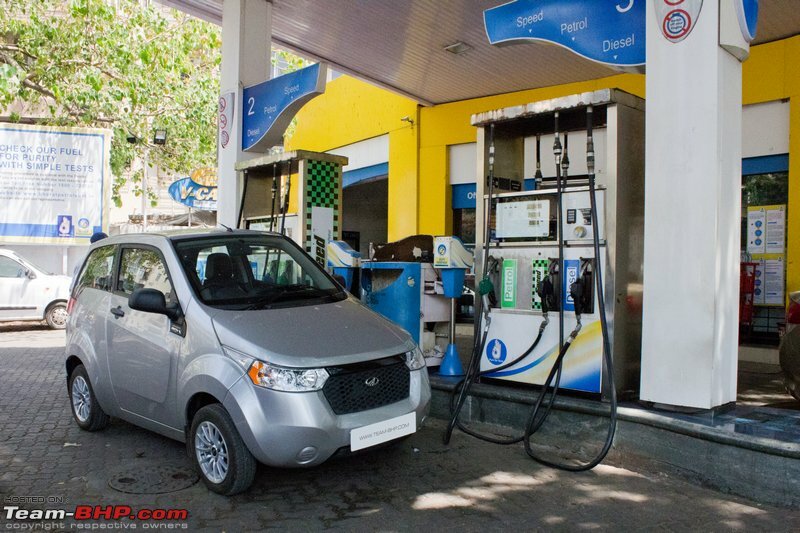 How far will the e2o go on one charge? That seems to be the biggest mystery with the vehicle. Mahindra has said "100 kms under test conditions", but people want to know the real-world range. We had the car with us for a few days, so we decided to put it to the test in typical Mumbai conditions. Day 1: Single driver zipping around. Day 2: Extremely rigorous family use. Given the above numbers, I think it should be possible to get close to the advertised 100 km per charge if you drive conservatively. It's also reassuring that the car is always telling you what your expected range is, so you can alter your driving style if required. Believe me, a range of 87 kms doesn't sound like a lot when compared to internal-combustion vehicles, but I realized just how long 87 kms within the city is. How long would the battery last if it was running just the air conditioner? From some rough calculations, you should be able to get 7-10 hours of cooling, which is plenty. Think of it this way : running just the AC for an hour uses roughly 10% of the battery. You could run the AC in a parked e2o for an hour and only lose ~8 kms of range. 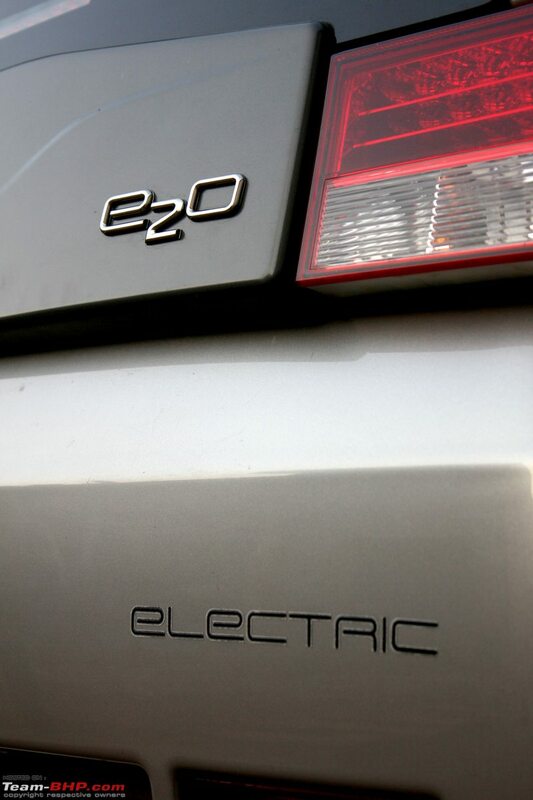 It's important to note that the e2o's performance is virtually the same if it's at 100% charge or 25% charge. Just like your smartphone doesn't perform differently at various charge levels. Below 20% however, the car goes into "Power Saving Mode". Boost mode is disabled and the gear indicator only shows "E" (instead of "F"orward or "B"oost). The e2o can still touch high speeds and climb slopes. It is only the rate of acceleration that is limited in this mode, in order to save battery charge. Below 10%, the gear indicator displays "L" and the display continues to flash "Power Save Mode". 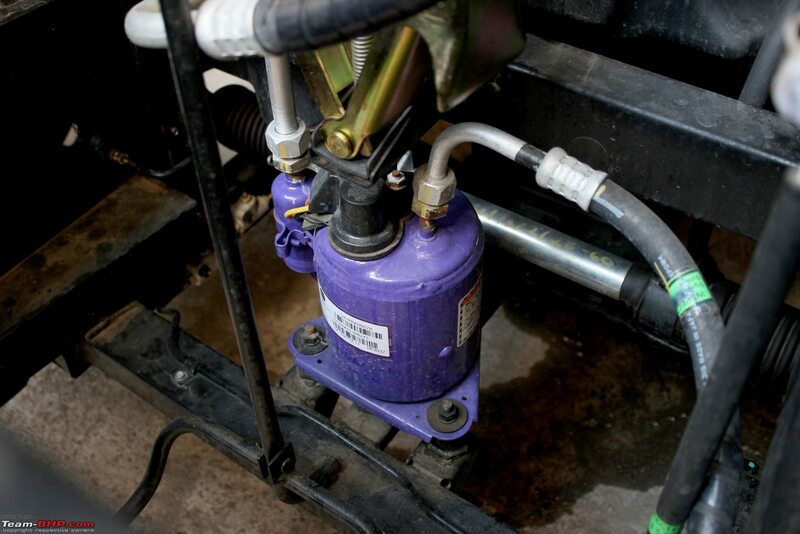 The AC compressor also restricts its operation and won't cool as well. The car can still climb steep inclines, but will do so at a slower rate (about 20-25 km/h on steep slopes). 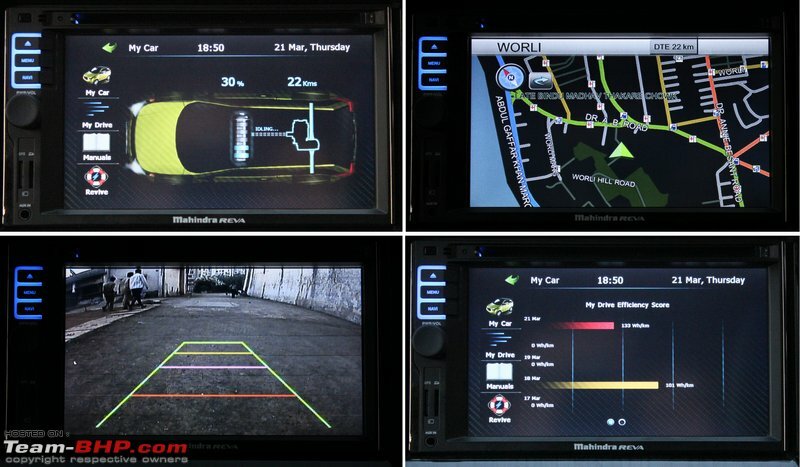 At 1% SOC, the display flashes "Stopping" and the e2o beeps softly. Despite this message, the car will continue to move for a while more. 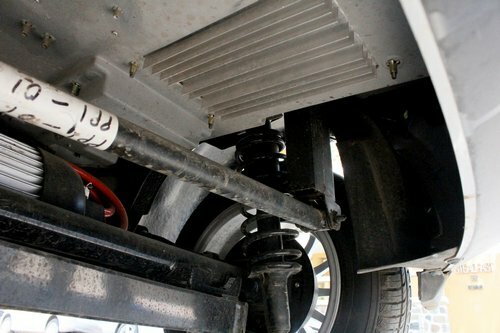 For the techies, the e2o's average discharge rate seems to be in the range of 90-140 wh/km. The Tesla S in comparison can pull between 180-380 wh/km. The e2o touts a feature they call "REVive". It's been marketed to sound amazing, like the car can be recharged via airwaves. But in reality, all you are doing is unlocking a hidden reserve charge from the battery. 1) Psychological: people feel safer knowing that there is a guaranteed fallback option if they run out of charge. 2) Lithium batteries last longer and stay healthier if they aren't discharged completely (called deep-cycling). It can be activated in 3 ways. Via the entertainment screen, mobile app or by a phone-call to Mahindra's 1-800 number. When activated, it gives you an additional 7% of battery charge, equating to 5-7 km more range. I don't think there is a limit to how many times you can run a REVive, but it's probably better for your car if you don't make it a habit. Both e2o variants come with a 48-volt Lithium-Ion battery pack with a 10 kwh capacity. A full charge reportedly takes 5 hours to complete. Mahindra Reva will help you set up a weather-sealed outdoor charge port at your residence or office, free of cost. It will be connected to your electric meter, which is almost always located on the ground floor. 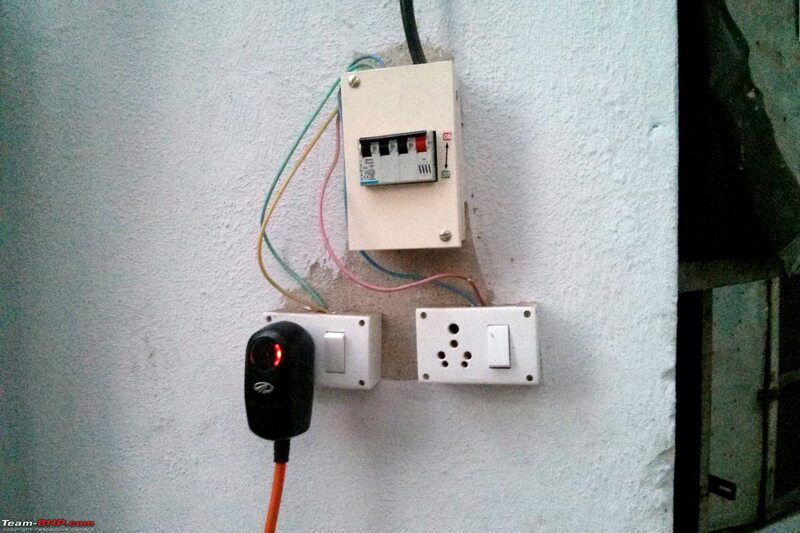 This makes integrating the e2o to your household a lot easier. 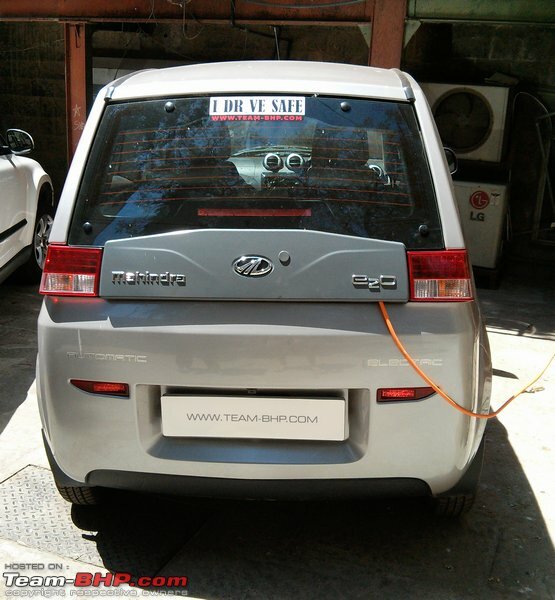 Mahindra has already set up over 250 charging stations in various cities. Bangalore has the majority of them, with a 100+, and Delhi comes in at a close second with 95. There will be more added soon. It's not a complicated task as it's just a regular plug-point after all! If you're on the road and looking for a charging station, the GPS on the entertainment display can point you to the closest one. Here's a state-wise list of charging stations. 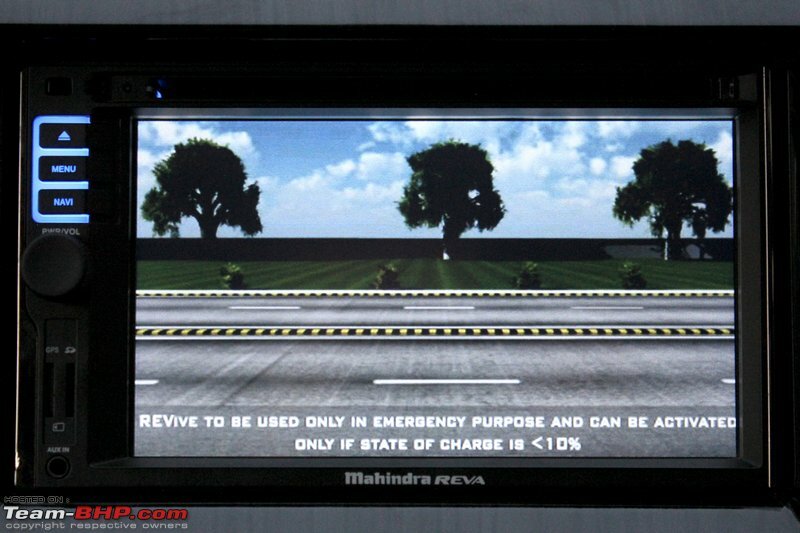 A majority of the charging stations are housed within Mahindra & Mahindra dealerships. As a safety precaution, the e2o will not move if the charging plug is connected. Trip meter A gets reset every time the charging plug is inserted. 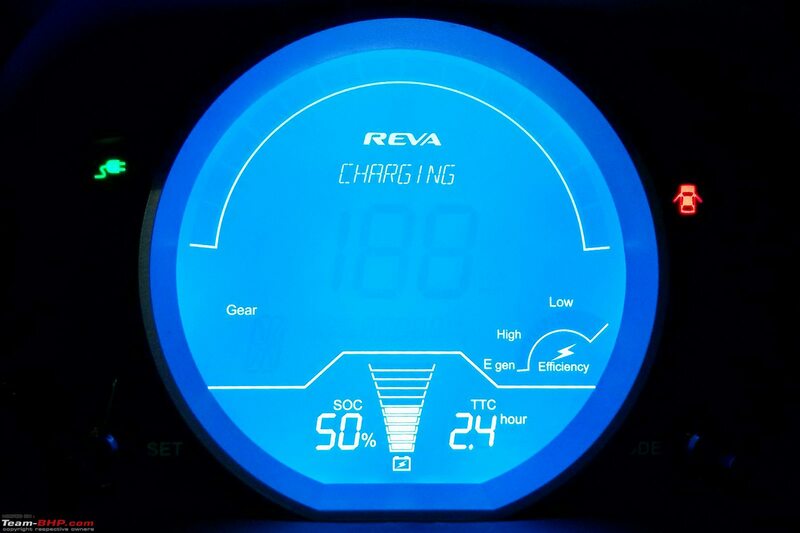 Unlike the old Reva-i, these batteries are maintenance free. No need to add distilled water or perform any maintenance yourself. The charging efficiency of the e2o is roughly 90%. This means that 10% of the electricity used gets wasted as heat. Vacation charging mode can be set via your car's personal webpage or the smart phone app. It enables you to set a period for which the battery will be charged at the ideal pace for storage (once in three days). Moderator Moralfibre mentions: There is some "Environment friendly" scheme launched by the government wherein having a battery charging station for electric vehicles gives builders some tax benefit. ( See page 29). The e2o is designed to operate at an ambient temperature of between 10 - 55 degrees centigrade, with no change in power or range. The 5 hour charging time is applicable only if the ambient temperature is within 10 - 45 degrees centigrade. Make sure your wall-socket is properly earthed, else a red light on the e2o plug-head lights up and the car won't charge. The good thing is that you can take only the charging cable along to test a plug-point (no need to move the car). A green light comes on if it's all good. Tip: Ensure that your entire household wiring uses an Earth Leakage Circuit Breaker (ELCB). 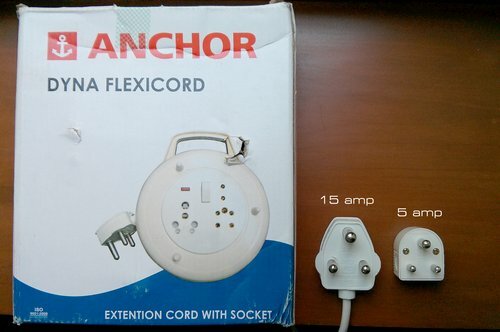 It can protect your entire house from electrical fires. Mahindra also offers a "Sun2car" solar charging station. The panels cover an area of 9 square-meters. However, at the current price of Rs. 1 - 1.6 Lakhs, it seems to be more of a topic of conversation than a feasible option for personal use. 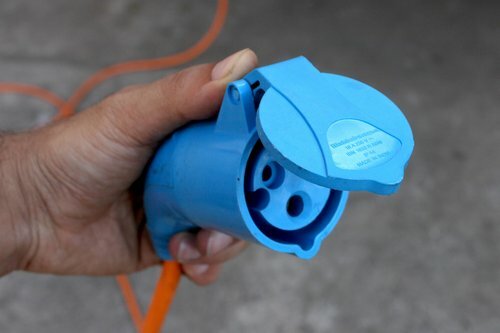 "Quick2Car" are the high-speed public charging stations that might be available soon. They claim 25 kms of charge in 15 minutes, or 60-70 minutes for a full charge! 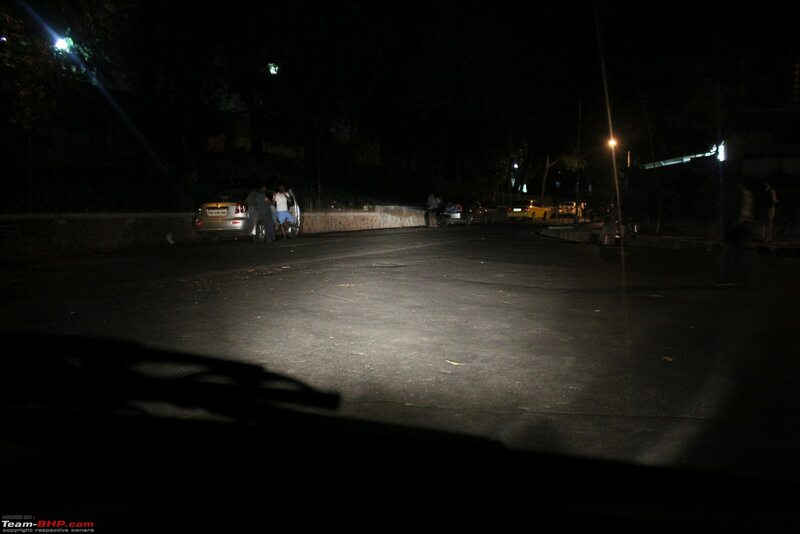 A lot of people asked what sense the e2o makes in a country with such irregular power and constant load-shedding. Well, here's a googly from Mahindra Reva: "Car2Home" is something they might introduce in the future that lets you power your home using the car's batteries. From my rough calculations, you could run 5 x 60w light bulbs for 40+ hours with an e2o battery. The paradox of electric cars is that they have unbeatably low running costs per km, but they also have severely limited km range per day. Catch 22! Proper quick-charging infrastructure should alleviate the problem in the near future. 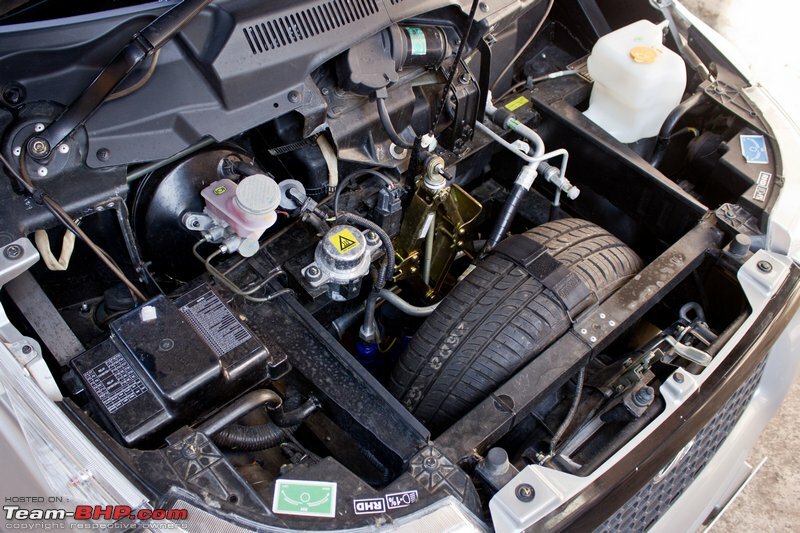 Mechanically, the e2o is a lot simpler than every other fossil-fuel powered car out there. There's no shiftable transmission. No alternator. No water pump. No fuel pump. No fuel filter. No belts to snap or replace. The general rule of thumb is that less complexity = less points of failure & less maintenance required. The standard warranty on the e2o (excluding battery) is 3 years / 36000 kms. The batteries come with a warranty of 3 years / 60,000 kms. The battery packs have fairly advanced monitoring for voltage and temperature. As a result, range and performance shouldn't see a decrease as the battery ages. Mahindra claims the battery will last for 5-7 years if taken care of well, and they say they have tested the battery for more than 120,000 kms with no drop in performance. A replacement battery costs Rs. 1.5 - 2.5 lakh (though it might have gone down by the time you have to replace it 3-5 years from now). Hope for the future of EVs? In the USA, it's actually required by law to warranty the battery pack for a full 8 years (10 years in California). 3 free services are included with the e2o (1 per year). Service technicians will visit your home for the service! 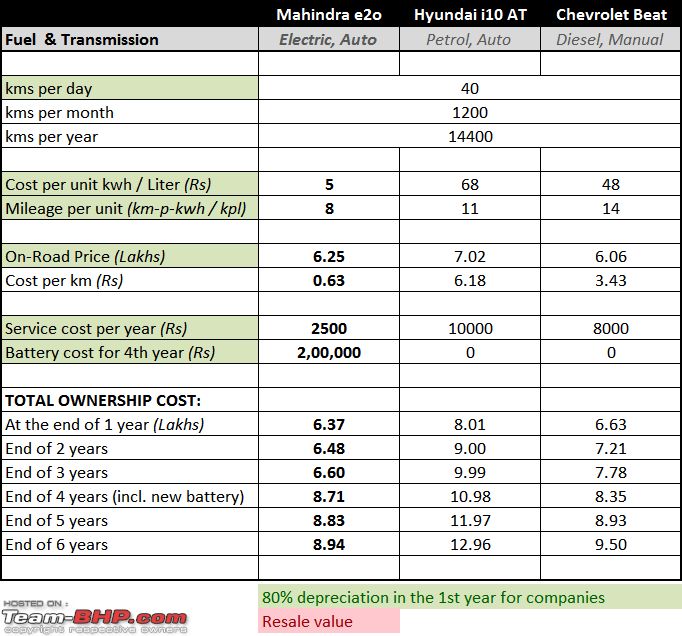 Mahindra says estimated service costs are Rs. 1,500 - 2,000 + taxes per service. It's a lot cheaper since there is no oil change required. 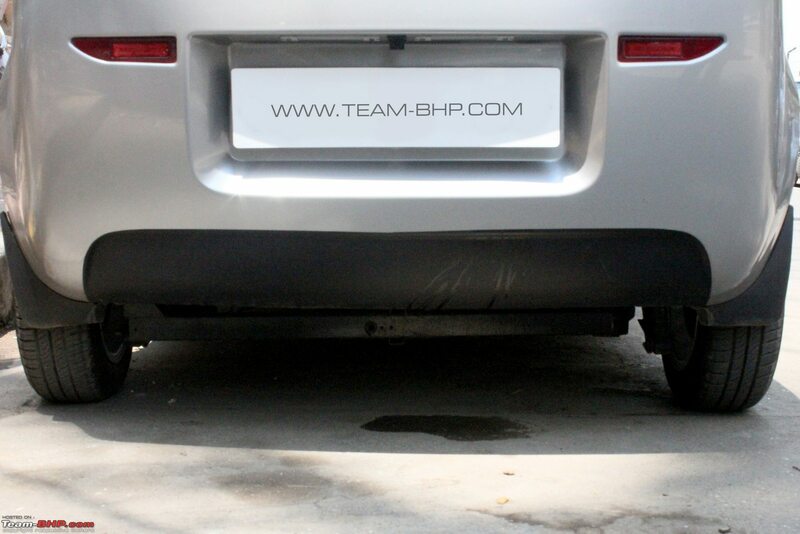 Team-BHP ownership reports of the Reva-i said that the Reva sales staff and after-sales support were well-informed, eager and provided an excellent experience. This includes the vehicle, fuel & electricity at Delhi prices. We used a fairly conservative 1200 km per month of running. Battery cost has been assumed to be 2L (4 years from now). We've heard figures ranging from 1.5 - 2.5L and Mahindra says its difficult to predict the price. The same calculation as above, but with the vehicle, fuel & electricity at Bangalore prices. You can download the XLS file (e2o Running Cost Calculator.xls) and input your own figures too. Note that the more kms you run per month, the more things go in favour of the e2o, due to its extremely low cost per km. •	The previous Reva was known as the “G-Wiz” in London, where it was relatively popular because it was exempt of London's steep congestion charge. 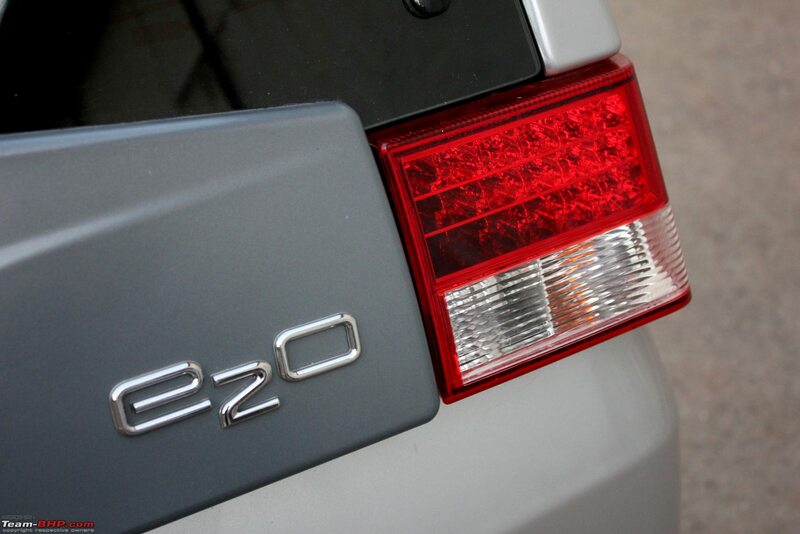 •	Pre-e2o, the company had sold 4,500 Revas in 24 countries. •	The e2o is currently available in Delhi, Bangalore, Mumbai, Pune, Ahmedabad, Hyderabad, Chandigarh, and Kochi. A European launch is on the cards for later in 2013. 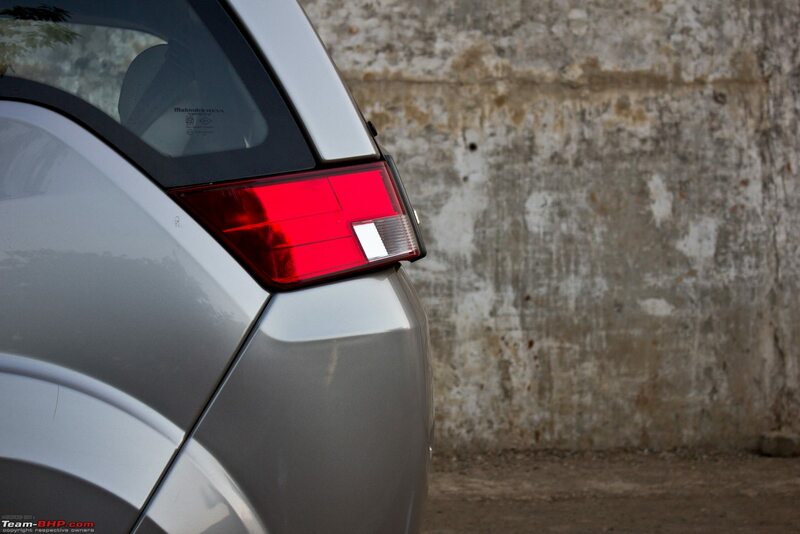 •	As a safety measure, the e2o wants you to shift to Neutral after it is switched on. •	You can shift between "F"orward and "B"oost without pressing the button on the gear lever. However, every other shift requires that button to be pressed. 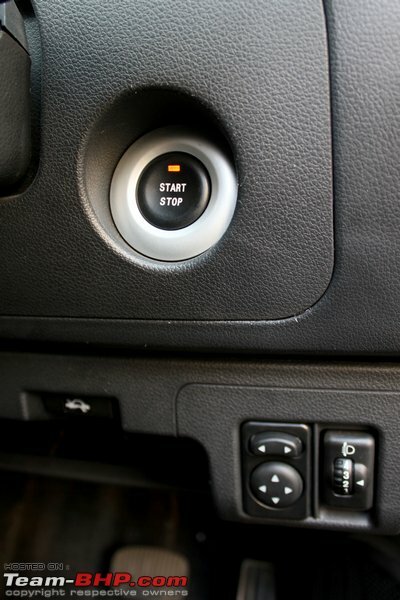 •	If you press the gear lever button, you can even switch from forward gear into reverse while the car is moving! This happens even at speeds of 15 km/h. I don't know if any other kind of protection has been built in, but I didn't risk trying to find out. •	You don't need to press the brake when shifting gears or starting the car. It would have been a better practice if they required that. •	When you park on a hill, you're relying ONLY on your hand brake. 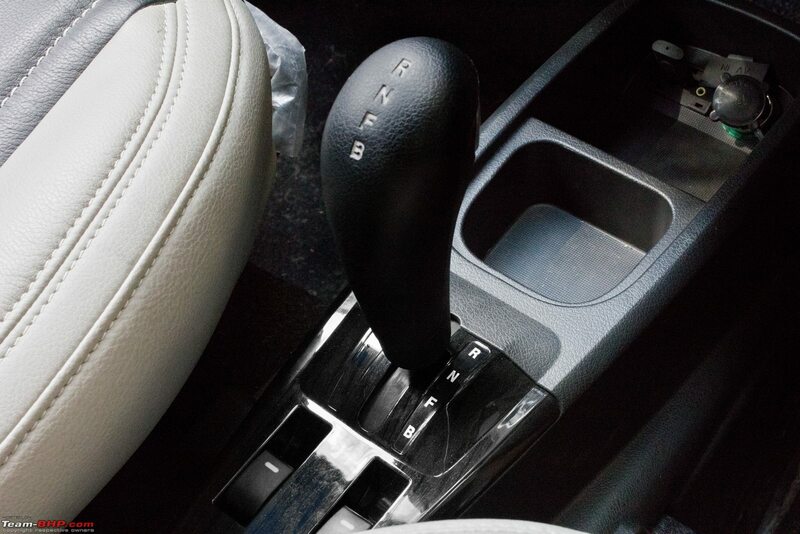 Unlike conventional cars, the transmission provides no resistance here. This lack of a double braking mechanism can be scary for people like me, whose permanent parking spot is on an incline. •	The car is extremely quiet when in motion, so people do not hear you coming. 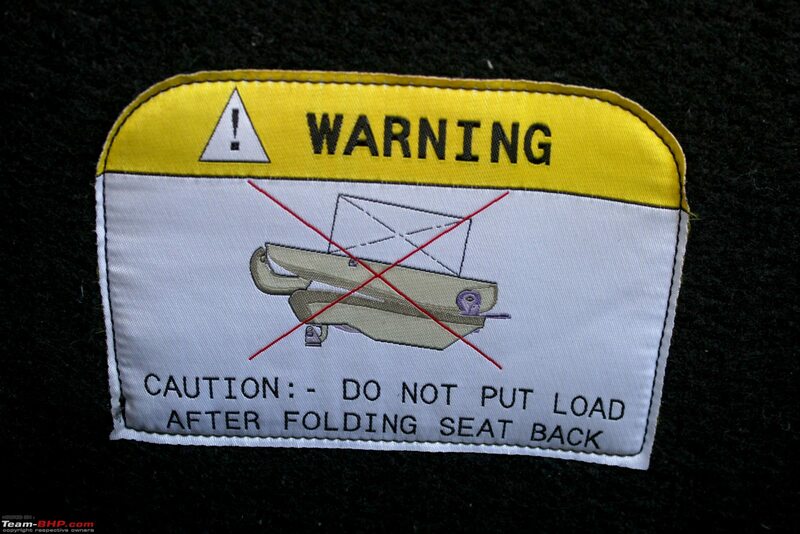 Keep this in mind and use the horn liberally to warn unsuspecting pedestrians. Thankfully, the horn is loud. of the e2o being driven through 8" deep water for testing. •	The indicator stalk got stuck in the downward position on day 2 of our drive. It had to be forced back up and wouldn't function smoothly after that. Ironic that it happened soon after we made a comment on the solid feel that the indicators had. •	Parrys says: small size, cool-factor and city-friendly nature make it an ideal car for self-drive rental companies (eg. 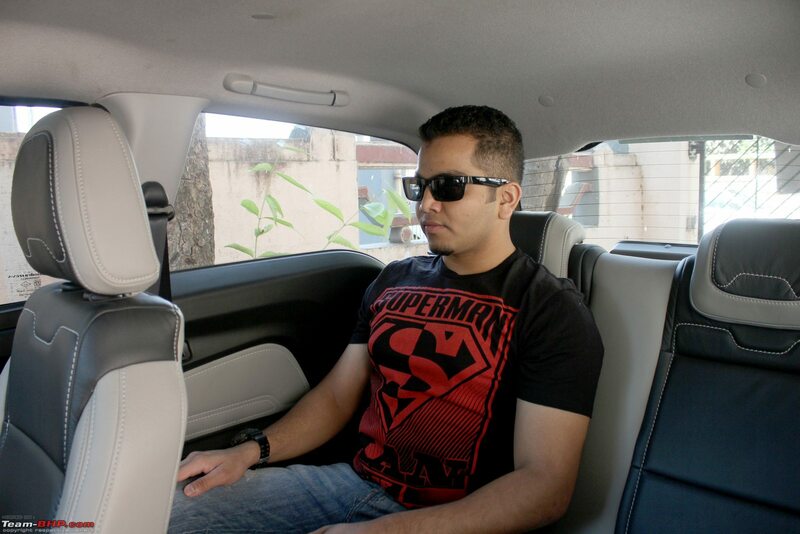 Zoomcar). He adds, if you charge your cell phone in the e2o, you'll be able to make more calls but drive less far. •	Mahindra should have really pushed for a high subsidy in Karnataka. Multiple reasons; their factory is based there (more incentive for the government to help) and Bangalore had the highest number of Reva-i owners. Delhi NCR (where the subsidy is currently offered) typically has extremely long commuting distances compared to other cities in India. •	Came across a few bugs with the AC controls and instrument display. Eg. The trip-meter mode button has a delay before it activates. The AC blower suddenly went to top-speed, even though it was at the slowest setting. •	Back around 2012, along with the NXR (now rebadged as the e2o), Reva had also announced the possibility of the "NXG" - an electric sports coupe. I wonder if we'll ever get to see that on the streets. 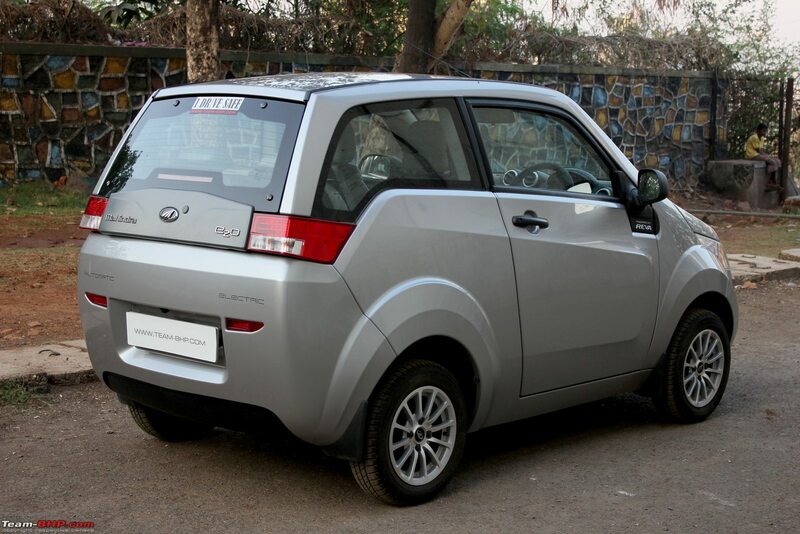 •	Last year, Mahindra had stated that they would lease battery packs to e2o owners to help reduce initial costs & take the fear of the significant battery replacement cost away. 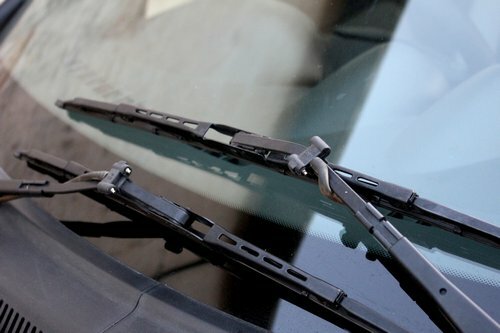 I thought this was a brilliant idea, but unfortunately it hasn't been implemented. •	Mahindra has just confirmed that an all-electric Verito will be launched within a year. They are already being used on some of Mahindra's campuses. •	Hybrid vehicles sound like a more natural first step towards getting Indians to adopt EV technology. However, hybrids are typically a lot more expensive than pure EVs, and this would be a big deterrent in our price sensitive market. Last edited by Rehaan : 9th April 2013 at 16:43. Available on iOS, Android and BlackBerry. We tested the Android version. The app has a very polished look. It's not one of those cheap apps that exist just for the sake of having an app. 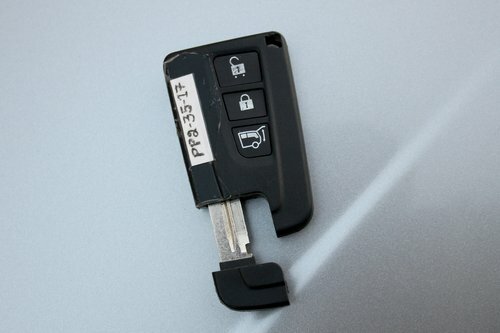 Once activated, it takes about 8 seconds to establish a connection; this delay prevents it from being a replacement for the key-fob when it comes to unlocking & locking the doors. I wish it was faster. The most useful feature is seeing the current state of charge and range, or how much your vehicle has charged when it's plugged in. 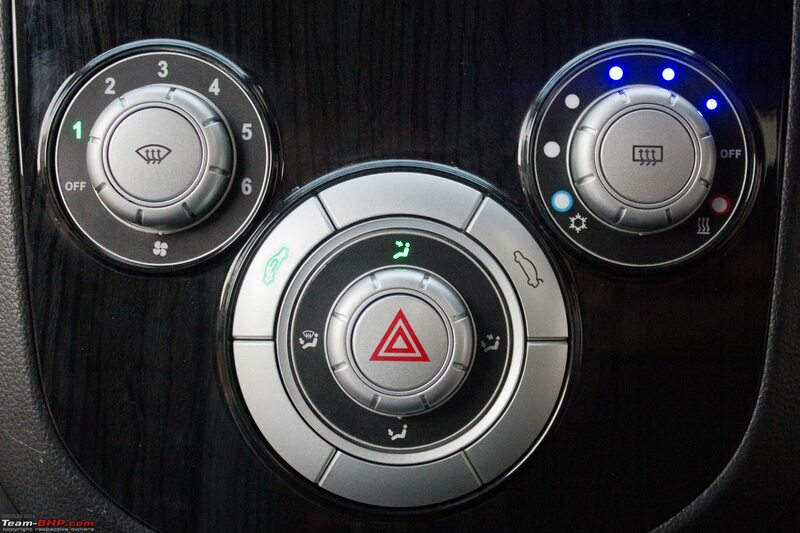 Ability to remotely turn on the AC is 'cool', especially since you also see the interior temperature of your vehicle. There was a scheduling option for turning on the AC, but the functionality seemed incomplete. The app can show you where the charge points are located, and your range overlaid on a Google map (as the bird flies). The green circle is the area in which you can complete a round-trip, while the red circle is the one-way range. For more specific trip info, you can use the "Plan your trip" option which uses Google's routing to determine the actual distance of the planned trip. If you leave the Android app and come back to it later, there is a time-stamp showing how old that information is; there is no way to "refresh" and see the updated info (eg. Charge level). This means that on Android, you have to kill the app every time you want to use it again. Mahindra offers a "Personal webpage for your car" which would probably be the same information presented online - for those who don't have supported smartphones. Last edited by Rehaan : 9th April 2013 at 11:15. Excellent review Rehaan, on a emerging segment that should see more investments and action in the market going ahead. This makes power stations 2-3 times more efficient than car engines. They also have far better means of converting the resultant bi-products into more eco-friendly elements. Not really an expert on this matter, but the bigger loss (in the electricity model) is in transmission & storage. That would nullify the earlier efficiency to quite an extent I believe. What needs to be given a lot more focus is the "Sun2car" solar charging station, which unfortunately isn't a viable option in the current scenario. The interior looks very good. Do they have plans for a non-electric version of this car? Also, are these charging stations free ? Last edited by srishiva : 9th April 2013 at 11:57. Awesome review Rehaan. I personally like the concept of electric car, though the shape and exterior of e2O is quirky IMHO! The dampener is the lack of support from the Government to provide enough subsidy which shall bring down the ownership cost! Unless that is done, I think the car is restricted to only people who need a second car meant ONLY for shopping/ pick and drop from/to school. Superb calculations and I was impressed the way the review is shaped. It considers the difference from the conventional cars and at the same time compares them too I did not come across such a detailed and informative review from any other source. Well done boys! Thanks for the brilliant review Rehaan. Even I was stunned by the quality and the overall fit and finish of the car. You told me "Wait till you actually see the car" - & it actually stood up to your claim. I am sure a lot of people will have a fair idea of how these electrics function once they read your review. Tech-Dream : Indeed. The 'start-ac' via mobile-app is my personal favorite. One more thing that surprised me was the fact that a lot of people were aware of the e20 (on the road); and they really wanted to know more. Rating this loooong review a well deserved 5*. Last edited by parrys : 9th April 2013 at 12:11. Now if we only had a competitor for this car in the market, perhaps we could see more realistic pricing. The range seems perfect for a city like Bangalore, where a long commute is typically 50 km in a day tops (the average would be about 25 km up and down). Is it possible to get auto financing for this one ? very good review of a very good car. I am amazed by M&M's strategy and focus. While 5 yrs back, TML was seen as the Indian car maker with a lot of future focus, the tables have COMPLETELY turned in M&M's favour and they are on a roll. The E20 has great potential in overseas markets immediately. As for India, as long as the MUL/HML lobby is strong, nothing much will happen. 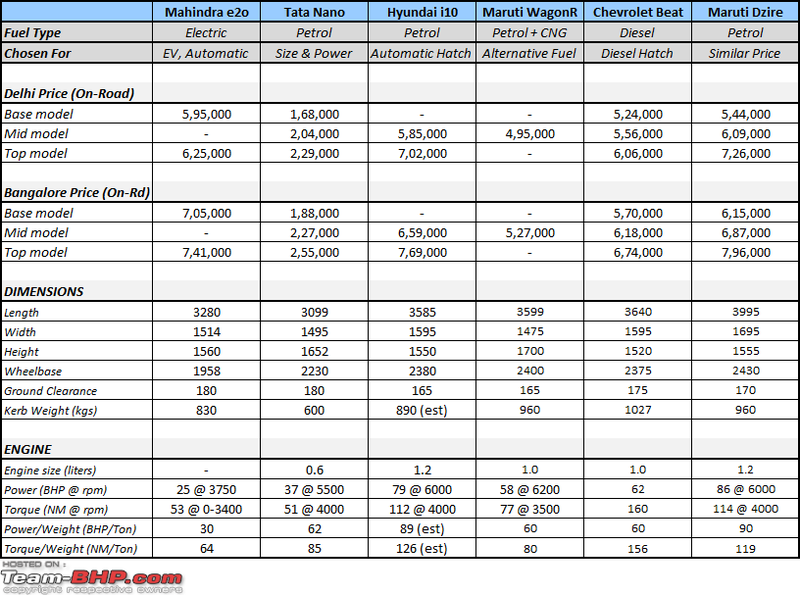 It will be an uphill task for M&M to influence any positive policy change to make such cars more affordable. Globally all green technologies have required governmental support by way of tax breaks to attain a certain critical mass. Once that happens, economies of scale will hopefully further help in bringing down battery costs which can help in making these cars a bit bigger and more comfortable. I am quite sure, M&M is the Indian automaker to watch out for in the next 10 yrs and they might most likely bring out a hybrid as well. You are correct to say that T&D losses eat into a large part of the inefficiency in the decentralised model BUT thats the case mostly with India only due to our lethargic attitude towards investment in the best T&D technologies as well as our lack of inclination to check power pilferage. If there was no power theft am quite sure, we can save 50% of the existing power cuts. Nice, comprehensive one there Rehaan. Apart from the price, which is a result of our lopsided greedy Govt policies, I do not think there is anything stopping the e2o from taking on the likes of the Alto, the Nano, the Spark, and to a certain extent the i10, the Santro and the WagonR as well.